We say goodbye to this year of "2014 Celebrations", a happy credit-card-commercial of festivities. With notable exceptions, for some of us the lasting feeling is of shallowness. But let's look forward to clearing the confetti and heading into a positive 2015! Cover shot of Harry Baglole and David Weale's End of an Era: Prince Edward Island's Resistance to Confederation, a 2014 printing of the original 1973 book on what the Island was like in 1864, and how the political climate changed. 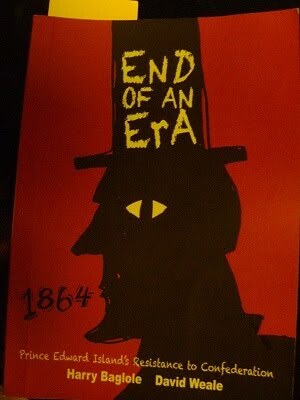 <snip> "And the future? Our 'gift of jurisdiction' remains with us, although somewhat squandered by lack of creative use. In 1973, we wrote about 'the Island way of life', whereas now we refer more often to 'the Island quality of life', as environmental concerns have come to the fore. Then, we faced the threat of Maritime Union; today our Legislative Assembly is confronted by a more insidious, internal challenge, and must summon the wisdom and will to protect the Island's precious reserves of soil and water." End of an Era, Part 3: Today is the last day to give to federal political parties for a tax receipt for this year, in case you have not already been hounded by any parties you many associate with. Some program of funding from the federal government ends this year, and with an election in 2015, the pitch is high. Pointing out yet another problem, but in a clear, let's-address-this-and-move-on way. With the end of the year very close, one thing to consider is giving, especially if you are hoping for a tax receipt for your donation. This program is like an "adopt-a-something" program were your contribution will be counted toward restoration and preservation of a specific area. Of course, *any* donation to the project is appreciated. are just three, and all have excellent websites for browsing and reading and learning on a cold day. Good points -- we need to keep this discussion going into 2015. This essay, published recently in the Journal of New Brunswick Studies, was sent my way, and is really worth the time to work through the 22 paragraphs (and they are so kindly numbered, too). Substitute P.E.I. for New Brunswick, and our agricultural model for forestry model, and much pertains to us; especially the language that will be used as we apparently move toward a provincial election this year. I put in bold a couple of the more brilliant comments, but it is all very interesting. A country begins to die when people think life is elsewhere and begin to leave. It begins to die when order disintegrates, when people cease to trust their fellow citizens or their government. In a country that is truly alive, the laws hold us in obedience, not just through fear of punishment but also through attachment to the values and traditions the laws protect. If this attachment wanes, if obedience is reduced to fear, either chaos or tyranny beckons. 1 New Brunswickers have long been accused of being resistant to change. It’s in our DNA, we are told. 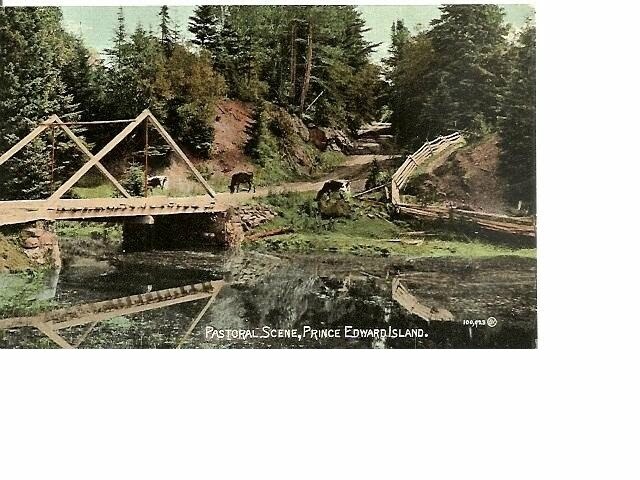 Provincial historian Ernie Forbes found evidence of this view in Maclean’s magazine as far back as 1926. The Maritime citizenry, wrote the Maclean’s columnist he uncovered, was “like a housewife who having married for money which failed to materialize ‘neglected her housework, went down to the seashore…watched the ships go by and pouted’” (qtd. in Forbes 59). Today’s conventional wisdom trades on that old myth. It holds that New Brunswickers want nothing: no shale gas, no forestry, no pipelines, and no energy sector. All they want, implies the myth, is the status quo, which they will fight for with a tenacity better directed to more practical ends. 2 New Brunswick’s former Conservative Minister of Energy Craig Leonard summoned this myth when criticizing opponents to his government’s recent forestry policy. “I would like to hear from any of those individuals what the alternative is,” said Leonard. “Give us a solution that allows for a vibrant forest industry to take place in the province. They haven’t done that. All they want is the status quo” (“Irving Clout with Government Challenged”). 3 Quite apart from the fact that his government (and the previous one) functioned unilaterally on the forestry file to stifle input from stakeholders, Minister Leonard’s response was recklessly rhetorical. It placed policy responsibility where it does not belong (on the shoulders of those who have much less responsibility than he does for being stewards of the public trust) and then it blamed citizens, once they had been disenfranchised, for a lack of solutions. 4 The Alward government’s other two most senior ministers took a similar rhetorical position in a commentary they co-authored in May 2014. Finance Minister Blaine Higgs and Health Minister Ted Flemming opened their commentary with the heavily freighted sentence, “It’s time for New Brunswickers to realize the next election is really about the next generation” (Higgs and Flemming). “It’s time for New Brunswickers to realize” suggests that, for decades, citizens have been indifferent to the demands of their society. “It’s time for New Brunswickers to realize” is another way of saying that citizens only want the status quo—and that anything other than the status quo they are vehemently against. 6 What I would like to do in this reflection is test that supposed truism, for it seems to have infused the political rhetoric of successive New Brunswick governments. And to do so I pose a simple question: What are the advantages of concluding that New Brunswickers are against everything—that their tendency is the habitual “saying no”? 7 For one thing, that view enables a deflection of the real problem, which is structurally embedded in our political system. One example of such deflection will suffice. For generations in this province, politicians and the political class have worked strenuously to divide people and communities against each other. The political narrative of the town I grew up in, for instance, was strongest in denouncing neighbouring towns for the perceived advantages they received. Provincial politicians invented this game, and citizens gladly played along, often electing the loudest mouthpiece they could in an effort to win the greatest partisan advantage. It was the adversarial Westminster system run amok. Is it any wonder that today’s strategies of rural amalgamation don’t work? That neighbouring communities can’t be brought to see the advantages of cooperation? When conventional wisdom holds that the people are the problem—that they are small-minded, timid, and unwilling to embrace new things—then a fundamental structural problem like the political system itself goes unnoticed. 8 To push the example to its logical conclusion, I would propose a quite reasonable solution: if governments do indeed see merit in wholesale amalgamation, then why not cut the number of MLAs in New Brunswick from 49 to 21 or 15? If the structure of representation changed, then wouldn’t that change also alter the political sociology of the ridings being represented? Of course it would. If Dalhousie and Campbellton, and Newcastle and Chatham, each had one representative, which they now more or less do, then those communities would learn to work together instead of working at odds. 9 To shrink a civil service, add more tax on a population, and reduce service delivery, while also refusing to address the essential core of a political system that has not worked well for New Brunswickers, is to impose change on others while exempting oneself from it. Why does this persist? Because of the strength of the myth that New Brunswickers are against everything. If New Brunswickers and other Canadians can be convinced of the truth of this myth of compulsive opposition, then the political system that ultimately created and sustains it can go unnoticed and unfixed. 10 Paternalism has become the new handmaiden of the state. And in New Brunswick, we are not strangers to its claims. The Bricklin was going to save us. Nuclear power was going to save us. Information technology was going to save us. Self-sufficiency was going to save us. Selling NB Power to Hydro Quebec was going to save us. And, now today, shale gas development, an east-west pipeline, and an enhanced energy corridor are going to save us. How these initiatives were (or are) going to save us has been a question of great concern for citizens, who have rallied, in predictable democratic fashion, to debate and sometimes contest these various panaceas for our deliverance from poverty and backwardness. In the process, that democratic reflex has angered and inconvenienced sitting politicians, who have based party identities or corporate allegiances on the success of their curative. 11 From the point of view of a political body trying to market a particular curative—for example, the Alward government’s vigorous attempts to normalize the benefits of shale gas development—citizen opposition is often answered (defensively) as the reaction of citizens who don’t really know what’s good for them. And if citizens can be convinced that they don’t know what’s good for them, then that empowers the state to act on their behalf. If those citizens can be further characterized as being ideologically, even culturally, averse to change and innovation (again, wired to be against everything), then their democratic impulse to question and debate is easily dismissed as disingenuousness, more like subversion or stubbornness than healthy concern. In the first case, the myth of compulsive opposition clears the way for the authority of the state, and in the second, it reduces participatory democracy to what is base, disruptive, and ignoble. In both instances, the rhetoric of compulsive opposition plays fast and loose with democratic entitlements, and is thus used recklessly by officials who live, and also die, by its consequences. 12 Writ larger, an unfortunate consequence of cultivating the myth of compulsive opposition is tacit support for shutting off the various wealth transfer taps that New Brunswick depends on. If New Brunswickers “want nothing,” then, by implication, that means they want a continuance of the status quo: namely, more money from Ottawa and Alberta. That expectation puts them at odds with recent history, which also makes them easy targets for the new federalism to do its work. 13 In a post-Keynesian era of scaling back wealth transfers and changing the practices of distributive federalism, it is both politically convenient and rhetorically effective to upgrade opposition (“New Brunswickers are against everything”) to pathology, thereby, once again, shifting the real problem from the state to the individual. In the current EI debate, for example, the more the focus is on the unwillingness of unemployed New Brunswickers to travel 100 kilometres to find work, the less likely it is that they will ask why this kind of mobility is necessary in the first place. If the behavioural pathology of New Brunswickers becomes the issue (that, again, they are against everything), then perhaps people will not ask why there are no Crown corporations in the province, why there are no defence industries in a province with one of the country’s largest military bases, and why there is such inequity between the tax and utility rates of citizens and corporations. Nurturing the myth that citizens are against everything is a sure way of obscuring the various political motives behind what we are told are amoral shifts in matters of federalism, patterns of trade, and changes in governance. When citizens are purported to be compulsive and unrealistic in their opposition to change and expectations of entitlement—when their crisis-response mechanisms are alleged to be dulled to the point where they have no capacity or willingness to act—then governments are free to redefine and assert trusteeship, acting unilaterally or in consort with special interests on behalf of a supposedly incompetent citizenry. No longer trustees of a public good kept vital in democracy’s sometimes-bloody arenas, these governments use power for self-interest, treating electorates not as bodies to be represented but as groups to be administered. 14 With such change come the consequences that provincial officials will die by, for that change does the essential work of affirming for others that New Brunswick’s problems are ultimately the problems of its citizens; that, in effect, the political class did all it could but the raw citizen material was not up to the task. This will confirm for many in the country what the post-Confederation narrative has been saying all along about malaise in the East, and will further excuse federalist forces from responsibility to a region and an economy that they configured and continue to disadvantage. 15 Our reflex as New Brunswickers is to protect our own when they are down or disparaged—and that extends to open criticism of public officials. While a vocal minority in the province seems to delight in public debate, the greater majority is more often silent, feeling that something hurtful or unfair has happened when criticism is levelled. As a provincial population we have to get over that feeling, for it is carefully inculcated in us, aimed at ensuring our compliance and fear, and, as a result, it is an impediment to our democratic maturity. If recent evidence of engagement and mobilization is any indication, however—witness the public response to the sale of NB Power or the citizen uprisings over the new forestry plan, both ultimately successful in bringing down sitting governments—citizens are starting to acquire that political maturity. Integral to that maturity is a culture of open and vigorous criticism. 16 To criticize is not to condemn, and critics worth their salt always take great care to ensure that their arguments are based on reason, not emotion, and are directed toward ideas, not individual personalities. 17 In the last two election cycles, New Brunswickers have shown a growing intolerance for the swinging-pendulum status quo: the red-party-in, blue-party-out pattern. They have made it clear that that pattern serves only the political class. In unprecedented numbers now, they know this to be true. 18 An informed, respectful, and passionate criticism complements that—a criticism aimed squarely at enhancing our democracy so that backroom deals and secret alliances are no longer part of our political subtext. Only in the presence of vigorous and ethically minded criticism will that be possible. Only if citizens insist on transparency, and publicly condemn its absence, will transparency ever become the norm in New Brunswick. 19 So what should the political class in New Brunswick know about one-term governments? They should know that citizens are better informed about the issues, better equipped to respond to them, and better able to mobilize around them than ever before. Moreover, an independent media of diverse forms is fomenting that has exceptional capacities to not only address all manner of subterfuge, but also to swing public opinion to degrees that were previously thought to be impossible. Because New Brunswick is small and geographically contained, the effect of these citizen actions is greatly amplified. 21 What is also clear is that, in wanting success for the many and not just the few, citizens in unprecedented numbers will reject austerity measures that target the already disadvantaged while bypassing the wealthy. And by “wealthy” I mean both the province’s business and corporate classes, those classes treated “lightly” even in comparison with provinces like Nova Scotia and PEI. Exempting those classes on the premise that to tax them equitably is to stifle growth is an old argument that New Brunswickers no longer believe. New Brunswickers have seen too little wealth distributed on the basis of that trickle-down logic. A small number of businesses and individuals have become wealthier while the vast majority has inherited only the massive debt. The days of “privatizing the profits and socializing the debt” must end. 22 Governments that do not understand this or choose to discount it will be condemned to single terms. An eight-year majority reign is the prize for the next government that invites (really invites) citizens to the table as equal partners—and, in so doing, treats the provincial electorate as more than rubes who are easily taxed, uncommonly negative, and temperamentally against everything. Tony Tremblay is Professor and Canada Research Chair in New Brunswick Studies at St. Thomas University. Last night at the holiday party, it was a great time chatting about the past and present, and looking forward to the New Year! It is going to be an interesting 2015, isn't it? Our next event is the viewing of the film Last Call at the Oasis, about water issues, on Wednesday, January 14th, at 7PM, at UPEI campus, Robertson Library, room 235. All are welcome! Many of these reports are on-line for the public to access. This leads to two thoughts -- one is that if things are transparent, then they are within sight. But you can have "transparency" and have things such a cluttered mess that people cannot find what they are looking for. 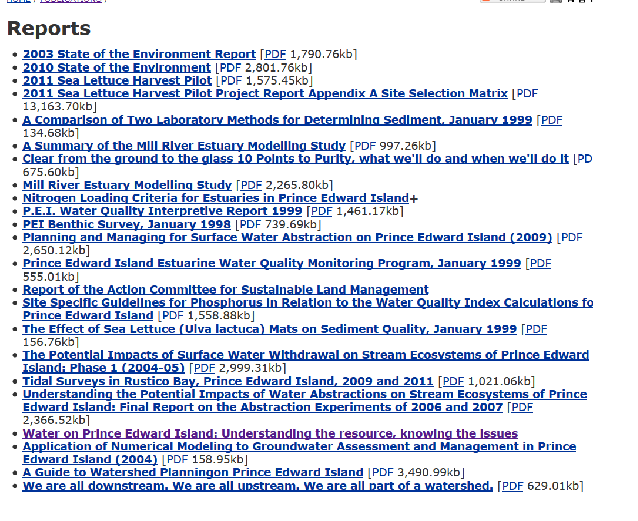 screenshot of publications page in Department of Environment's website. The Department of Agriculture website is actually worse due to its cataloging of reports under different topics, so it's very hard to find the titles that the Cassandra PEI showed. There may be another spot where it is easier to find them. The second thought about is that when you actually find and open one, you see many similar recommendations, but little mechanism for the group selected to make these suggestions to have any follow-up on the implementation. And obviously, what the groups were often suggesting were more than a government really wanted to do. But, as Cassandra PEI said, the climate is changing, in more ways than one, and more people are aware and ready to push for positive change in what appear to be negative patterns. Todd MacLean and Savannah Belsher-MacLean will be at the Farmers' Market in Charlottetown from 9AM to 2PM to sign copies of the book Global Chorus, and just to chat about anything in general. The 365 inspiring short essays are arranged with dates (beginning with January 1st), and many of us bought copies specifically to start reading on Thursday, the first of January. Their Global Chorus table may be tucked around the corner by the mini-donuts and the new ATM machine by the picnic tables, where it was last week, if you are going to be in Charlottetown and want to stop by. Today's Guardian is predominated by the Premier and his legacy. This week The Guardian and CBC will feature friendly year-end interviews with Premier Robert Ghiz. This makes it a good time to remember some “awkward truths” about this government, especially as it’s been exactly two years since the Plan B highway project was announced. The asphalt is down, the guard rails up — it’s not just a “done deal”, as Transportation Minister Robert Vessey said at the onset, but it looks done. Not quite. There are still many steep bare hillsides underneath snow and a bit of mulched hay, which will bear watching when winter rains and the spring melt occur; it is likely to overwhelm the mitigations and allow sediment to enter the West River, as has happened numerous times in the past year. “It is valuable to continue to bear witness to the environmental impact of Plan B,” said Island ecologist Gary Schneider in November of 2012, after Plan B construction started. Nobody is living in a teepee by the project this winter, but people are watching for the rains, and the long-term health of the remaining trees next to the road. Why did people get so involved in Plan B? What made us literally wake up and venture from our comfortable homes to stand on the roadside with signs or camp in the woods, be criticized and ridiculed by some government and media people and sever the previously carefree relationships with our elected officials? Like a majority of Islanders, we were disturbed that government decided to run a highway we can’t afford through land and homes we can’t replace and over people’s rights to be consulted with and desire to be listened to. Plan B was such an egregious example of a bad decision not being recanted that many of us got involved. 1) “It’s all about safety,” as the segment was described as the most dangerous stretch of road, due to design — but only after the Atlantic Gateway money was announced. Hence the expensive over-reaction realignment, against countless letters imploring and illustrating cheaper and more effective solutions. The real causes of accidents — when the data were finally released in Fall 2012 — were slippery roads and driving too fast for conditions, factors Plan B is not going to solve. 2) “Islanders told us to go north” in feedback for the original plan to go through Strathgartney Park, which the TIR insisted counted as consultation for a completely new Plan B. In fact, out of over 300 submissions in Fall of 2011, not one suggested the route be changed to cut into the untouched hillside north of the CBC tower on western end and Fairyland on the eastern side. The Robert Ghiz government ignored or denigrated a petition, rallies, a citizen-initiated plebiscite, countless letters, over 200 Environmental Impact Assessment submissions, and finally people at the site, by calling in the national police force to pull out a couple of women keeping vigil by the ill-fated hemlock forest in the pouring rain. (Premier Ghiz) apparently remains unmoved by the spectacle of RCMP officers hoisting and hustling citizens off their own land, and unconscious of the harm he is doing to the RCMP, his own government and the very essence of democracy itself. — columnist Jack MacAndrew, October 2012. This part has been hard to explain to kids. Plan B is not an extreme example, but one of the worst of many poor decisions. For instance, the implementation of the HST has been hailed by Mr. Ghiz as one of his greatest achievements of 2013. He said it’s not great policy — he is right, as it is merely a tax grab - but it is neither great policy nor politics to run for office without mentioning something as important as implementing the HST. A new “wilderness” park isn’t going to erase Plan B — though no wilderness by far, it’s still a lovely area — but if the Ghiz government had actually wanted to protect environmentally sensitive land (a term set out by Environment Minister Sherry in her conditional approval of Plan B), they would not have bulldozed right through the Bonshaw Hills to make this road in the first place. Will Plan B opponents ever let it go? For the most part, we are a pretty positive bunch. We’ve channeled some of the energy into the fledgling Citizens’ Alliance of P.E.I., a non-partisan voice for Islanders to bring forth those “awkward truths”, especially concerning environmental and democratic issues. Plan B has reinforced that we — all Islanders — need to take care of our Island, both our land and our democracy. Keeping both healthy will encourage our young people to be here making a living and dropping the cynicism that their participation isn’t necessary. And that should be Plan A.
Chris Ortenburger lives in Bonshaw and is a member of the Citizens’ Alliance of P.E.I. So come join our Citizens' Alliance Holiday gathering tonight, 7PM, at the Bonshaw Community Centre, 25 Green Road, Bonshaw. It's a bit of a potluck, so please bring an easy snack to share and perhaps something to share to drink (we'll have tea, coffee, and some mulled apple cider). Dan Viau was mentioned in the local media twice this month, more recently for a toy-giving program where the Bricktek company(unrelated comments below)** would give a Lego-like building block set to the Salvation Army for every one sold in his toy shop. Dan and Kathy's shop is the eminently local The Toy Factory, in New Glasgow. The other news item concerning Mr. Viau, when not making toys, was that he embodied the face, legs, arms and brains of CTV News on P.E.I., as a reporter/cameraman. CTV announced that they were shutting a local P.E.I. presence, and will cover our province from Moncton. Apparently, they have been doing that for the time Mr. Viau has been out on medical leave. Back to Mr. Viau. The Guardian article indicated he had hurt his knee hauling his camera and equipment up and down Plan B. I winced, as I can guess where and how; and I winced, thinking that the unwanted highway project caused all the media attention, and resulted in various related negative effects. Most Islanders, and especially those who watch CTV, are likely thankful for Dan Viau, for that aspect of his work. Let's hope it has been a good toy year, too. 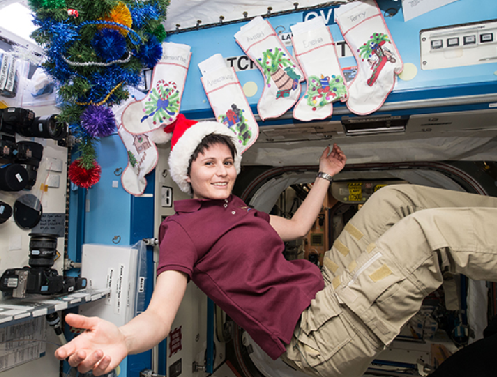 The Shuttle program was retired in 2011, but the International Space Station is up in Low Earth Orbit and currently has two female astronauts on board an international crew of six, Elena Serova and Samantha Cristoforetti. The commissioner of the National Hockey League has good reason to be concerned about global warming. “Our sport was born on frozen ponds and to this day relies on winter weather,” Gary Bettman said. Two weeks before one of the most popular games on the league’s schedule, the outdoor Winter Classic, between the Washington Capitals and the Chicago Blackhawks at Nationals Park (the Washington, D.C., home location of the professional baseball team "Washington Nationals") on New Year’s Day, Bettman announced that the NHL will wipe out its carbon footprint by the end of the season. The league teamed up with Constellation Energy, Baltimore, which will conduct an energy-efficiency analysis starting in the next few days to determine whether the NHL can improve lighting and refrigerator motors that cool everything from the rinks to the drinks. Bettman said it will start at Verizon Center, where the Capitals play. Bettman said the NHL is simply “taking an active role to preserve the environment and the roots of our game.” But Allen Hershkowitz, president of the Green Sports Alliance, said the potential impact goes far beyond that. There’s a broader message when a sport with 30 teams and tens of millions of fans around the world acts as an aggressive environmental steward, Hershkowitz said. This was passed on to me with a request to share, as it's timely. From sustainability writer, speaker and columnist John Duivenvoorden, it muses a bit about about "What would Jesus say about Climate Change? ", first published December 23rd, 2014, in the New Brunswick Telegraph Journal and Fredericton Daily Gleaner. And a Christmas gift, care of the people that created, produced and starred in "Lord, What Fools!" 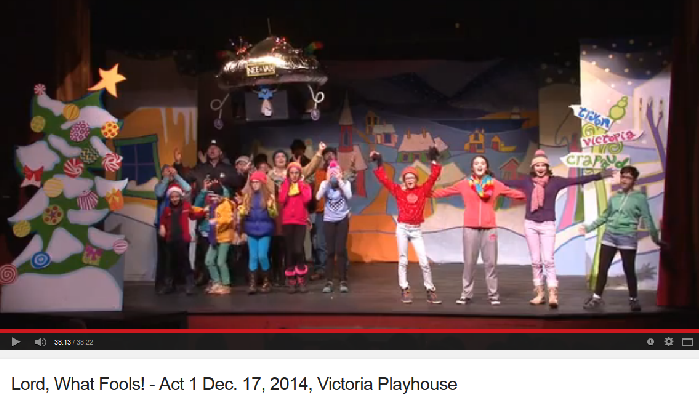 at Victoria Playhouse last weekend: the entire play on YouTube. Thanks to Perry Williams for filming and posting. It would make delightful viewing on a rainy afternoon or Boxing Day. Thanks, dear people. screenshot of YouTube link for "Lord, What Fools!" Christmas play. Wade MacLauchlan is on a red carpet ride to a coronation as Liberal leader. Rob Lantz is one of the leading contenders to become the next leader of the provincial Conservatives. For different reasons, both share a credibility issue with voters. MacLauchlan entered the Liberal race – and effectively shut down any potential credible opposition – with a carefully stage-managed event at the North Shore Community Centre. It seemed to play well, at least to those in the room and die hard Liberals across the province. But the image of a Liberal love fest has different meaning for different people. The most striking impression for many was MacLauchlan’s decision to voluntarily share the stage with 19 Liberal MLAs, all grinning like Cheshire cats, while proclaiming himself ‘Optimist in Chief’. There is a deep frustration with the Ghiz administration and its anaemic, self-serving, centralizing focus of the past eight years. MacLauchlan’s decision to make his political entry in lockstep with the Ghiz caucus is raising questions about his ability to deliver the type of change PEI desperately needs. You could almost hear a shared cringe across PEI when Health Minister Doug Currie opined in an interview MacLauchlan’s candidacy is about building on the record of the last eight years. No, Minister. That is not the change Islanders want. Lantz is perhaps best known to Islanders as the heritage promoting guy on Charlottetown City Council who seemed to lose more political fights than he won. Lantz is smart, young and a fresh face. No one really knows what he stands for or whether he has the qualities needed to lead a provincial party and ultimately become premier. An engaged leadership debate, which the Tories will have, will help answer that question. To succeed Lantz will likely steal a page from the Robert Ghiz playbook. Both are Brighton boys, the ritzy area of Charlottetown where the elite of Island business, bureaucracy, academia and political backrooms live. The neighbourhood often breeds perceptions of entitlement not shared by most Islanders. Rob Lantz has no record in rural PEI. Like Ghiz he will canvas rural PEI and ask for support. Like Ghiz he will promise the world. The question is will he, like Ghiz, ignore rural PEI the minute he achieves his goal? It would be impossible to be less enthusiastic about rural issues. On the plus side, Rob Lantz is the first candidate wanting to be premier who actually uses ‘excellence’ as a goal for our chronically under-performing education system. Lantz is supported by the Charlottetown Tory backroom, the same group of hyper political operatives who sharpened and delivered the knives that ultimately led to the Tory leadership bloodbath under Olive Crane. This is a group of partisans primarily driven by the spoils of power. Vision and leadership are an afterthought. They are the Tory version of the Ghiz cronies who enjoyed eight years of unfettered access to a taxpayer-supplied trough. For eight years the Tories have positioned themselves as the party of rural. Indeed that is where the party’s power base (if you can call it that) exists. Rob Lantz needs rural support to win the leadership. His primary competitor James Aylward is positioning himself as the rural voice. Interestingly, Lantz is noncommittal to party workers when asked about allowing Olive Crane back in the party. Aylward, who many Tories see as weak, offers an emphatic no. No one will claim that Lantz and Aylward are dream candidates. That does not mean they cannot grow into leadership. They do present a contrast. There will be a debate on ideas and how best to move forward. Liberals cannot claim the same. Over-sized cheques written for ministerial photo ops will not solve the issues rural PEI faces. Politicians, of all stripes, will not solve any issue by failing to deal with the demographic tidal wave powering toward us. Our issues are not solved by hollow rhetoric and condescending platitudes on the importance of rural communities. Over the next four months we will hear a lot of both. Only when politicians look at the issues with a sincere desire to effect long-term change, rather than short-term political advantage, will we trust. Wade MacLauchlan damaged his reputation with voters through his embrace of the Ghiz caucus. It was a fleeting photo-op with potentially long term implications. No one should question Lantz’s sincerity, but he has the unfortunate task of following Robert Ghiz whose rhetoric never matched achievement in rural PEI, in large part because when power was obtained Ghiz listened to his backroom power brokers. We’ve seen the greed and self-serving nature of the Tory backroom both in power and in the blood let on the floor during the Crane leadership debacle. It is a fair question whether history will repeat itself? Our issues demand real leadership. As a province we cannot afford history to show that the next four months ended up being yet another example of rural residents being taken for fools. Given the season, it seems a bit unseemly to challenge the province’s self designated Optimist-In-Chief on just what exactly constitutes censorship. Certainly, most would think that any prevention of the dissemination or distribution of opinions, ideals, or comment, that weren’t libellous or slanderous, would amount to censorship. Giving offence is not usually considered to be libellous or slanderous. When, as president of UPEI, Wade MacLauchlan, swooped up all copies of an issue of The Cadre, the student newspaper, because he found the Danish cartoons it published to be offensive, it is difficult to see his action as anything other than censorship. But, on the front page of Monday’s Guardian, with his rose-coloured glasses firmly in place, Mr. MacLauchlan denied that preventing the distribution of The Cadre was censorship. The Guardian article didn’t go into what legal niceties or hair-splitting rationale Mr. MacLauchlan used to arrive at this conclusion. And given that this is the season of Good Cheer and Santa Claus, perhaps it’s a debate best left for another time. John Lennon once said something like -- "The only thing they don't know how to handle is non-violence and humor." Speaking of non-violence and humour (we can only hope), if you are free, stop in for a holiday social in Bonshaw, Saturday evening, December 27th, 7PM, Bonshaw Community Centre, 25 Green Road. We have perhaps outgrown calling it the "Plan B Holiday Party", but you get the idea. Bring a little something to share for eating and drinking, if you can. And speaking of John Lennon, and a grand version of one of his songs, here is are "The Three Tenors" (Jose Carreras, Luciano Pavarotti, and Placido Domingo) singing "War is Over (So This is Christmas)" from 1999 with the Vienna Philharmonic. Not quite two weeks ago, the Island had an amazing rainstorm. Certainly not a 1-in-100 year rain, but amazing. West Prince received the most rain and suffered the most damage to infrastructure. Bold (and comments in parentheses) are mine. 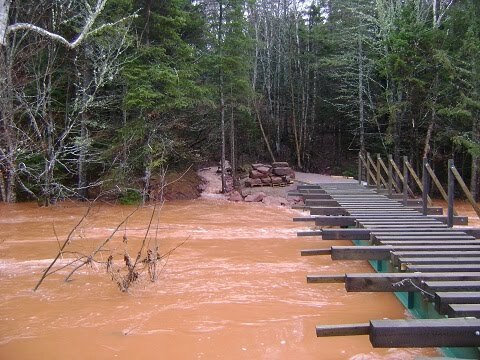 NDP PEI Leader Mike Redmond is blaming the provincial Liberal government for damage to highways and bridges in West Prince because the Liberals did not prepare for the impacts of climate change on the Island’s transportation system. “The Liberals had seven and half years to mitigate the impacts of climate change on our transportation system, and they did nothing,” stated Redmond. Media reports indicate five bridges will have to be replaced in West Prince due to the huge rainfall of last week. “The Liberals never spoke about climate change impacts on transportation. They did no assessments on roads and bridges considering the more extreme weather conditions. We now see five bridges in need of replacement. This is a major inconvenience and danger to Islanders that could have been avoided,” added the NDP Leader. “The Liberals had their heads elsewhere. They spent millions on construction. They did projects that they could not justify to the public. Never did they consider climate change. Now Islanders will pay with huge repair costs and ongoing safety concerns. An NDP government will be upfront about climate change impacts, conduct mitigation measures and work with municipal governments and property owners to avoid future disasters associated with climate change,” concluded Redmond. NDP P.E.I. Leader Mike Redmond is giving too much credit to the provincial Liberal government. In an apocalyptic statement last week, Mr. Redmond blamed recent damage to highways and bridges in West Prince squarely on the provincial government. The damage was the result of the powerful rainstorm which pounded the province some 10 days ago, but hit West Prince especially hard. At first blush, it seems Mr. Redmond is either crediting the Liberals with unusual powers to affect weather patterns or contributing to climate change. But he goes on to explain the damage occurred because the Liberals did not prepare for the impact of climate change on the Island’s transportation system. Most warnings about climate change, at least for P.E.I., refer to rising sea levels that threaten our shorelines with erosion and heavy surf. If the province was going to take action, it should direct its attention on coastlines and tidal estuaries most at risk from the sea. 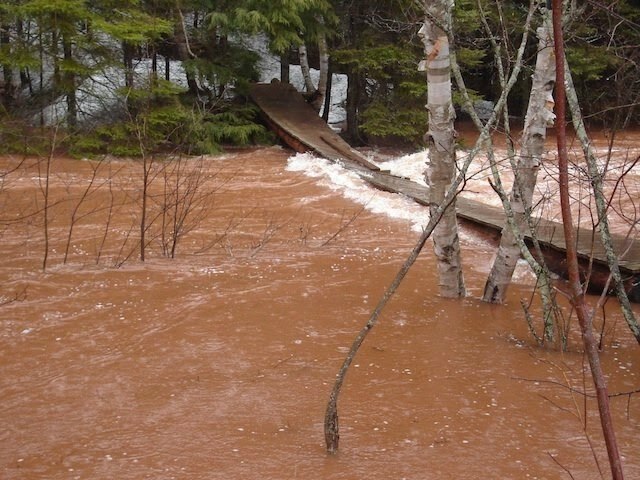 It might be a stretch in this case to suggest that the widespread damage was the result of climate change and not by an intense low-pressure system which stalled over the Gulf of Maine and dumped record amounts of rain on P.E.I. Or, that road, culvert and bridge washouts are the direct result of government inaction by failing to shore up infrastructure from a once-in-a-lifetime rainfall and subsequent flooding. Mr. Redmond says the government had seven and half years to mitigate the impacts of climate change on our transportation system, and it did nothing. His arguments have some merit when it comes to the failure to replace culverts where minor flooding has been commonplace during spring thaws or heavy rains. Mr. Redmond suggests that increasingly common extreme weather conditions should have alerted the government to do assessments on roads and bridges. The province is regularly replacing bridge structures but more because of aging and gradual erosion concerns than climate change. He says an NDP government will be upfront about climate impacts, conduct mitigation measures and work with municipal governments and property owners to avoid future disasters associated with climate change. Well, to avoid such storm damage like that of 10-12 days ago, you have to control jet streams and low pressure paths, and no political party has developed that power just yet. Wading through all the hyperbole, one has to conclude that the writers don't really understand climate change -- because intense storms, in addition to coastal erosion, are hallmarks of our changing climate. "Climate change refers to a long-term shift in average weather patterns. This can include changes in temperature, rain and snowfall amounts, and wind. Our climate has changed in the past, but it is now changing faster than at any other time in recorded history." 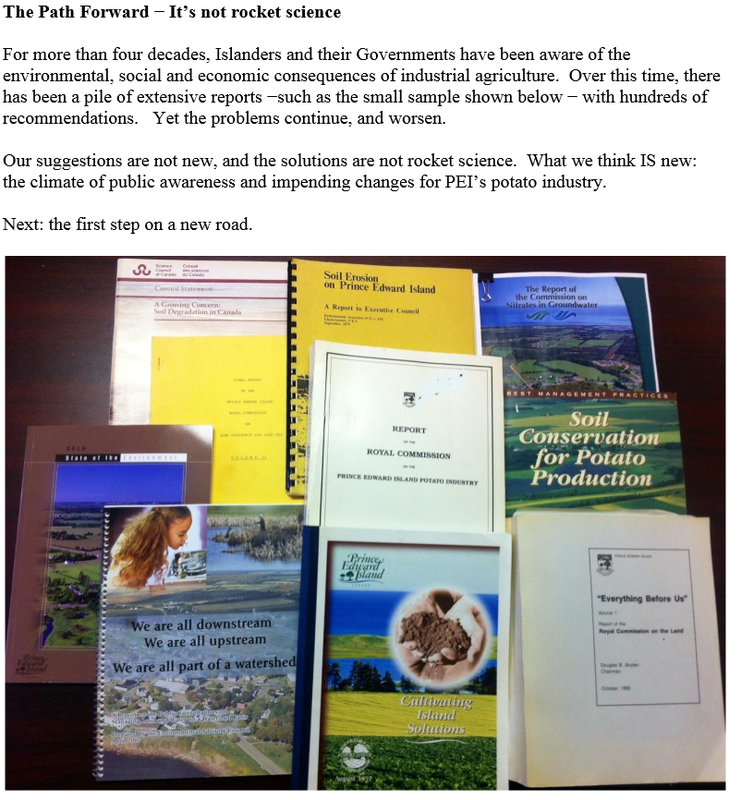 The Department of Environment, back when George Webster was Minister of Pop Environment, released its Climate Change Strategy in 2008 (link below). The excerpt below is from the page on the website, which says it was updated in August 2014, but is definitely in need of checking in the Renewable Energy paragraph. Energy Efficiency and Conservation - The Office of Energy Efficiency developed a number of programs to help homeowners and businesses use less energy and reduce greenhouse gas emissions. So far, over $7.5 million has been provided for this work. Renewable Energy - PEI is now generating 20% (174 MW) of its energy needs using the wind (a renewable source of energy). This number is espected (sic) to reach 30% (204 MW) by the end of 2013. Biomass (wood) systems are now heating seven large government facilities (schools, hospitals, etc.) across the province. Recent contracts will see similar heating systems established in another 13 facilities. screen shot of Don Jardine's presentation in 2009. The Strategy makes mention of the Working Group on Climate Change, about which I cannot find anything more that Mr. Jardine saying they met four times as of 2009. And I haven't really ever heard Transportation ministers MacKinley (2007-2011) or Vessey (2011-present) speak about it the working group, or Climate Change in general. What a pleasure to hear from Dr. Herb Dickieson, candidate for the NDP for the federal riding of Egmont, coming forth and voicing his concerns for federal disaster assistance for West Prince. In one brief statement, Gail Shea stated that once $1 million is used by our provincial government, the federal funds should kick in and excluding Mr. Vessey, who is Minister of Transportation, not one other sitting federal or provincial member nor anyone seeking such a position has voiced an opinion. The $1 million Ron MacKinley confiscated from the rural infrastructure fund to build a parking lot in Charlottetown would come in handy now. With climate change’s slow encroachment upon us, it is obvious culverts and bridges are undersized and restricting flows. The bridge in Arlington was redone about five years ago and due to flow restriction the area has flooded four times and the bridge has had sink holes on it at least once. Do we have any competent engineers on these projects? Are culverts being changed to a larger size or are the undersized ones being used? The culverts size should be increased. Substandard methods and practices equal potential loss. Tossing a shovel full of sand into a crater and patting it down seems to be government’s answer. Obviously there are inadequacies in their remedial actions. If remedies are not adequately implemented, the original problem reoccurs and the cost to taxpayers increases dramatically. People are unable to earn a full paycheque because their work places are flooded, equipment and property has been destroyed and all of this just before Christmas. Will Gail Shea’s disaster fund be compensating these folks? Obviously the province doesn’t seem to care as they are telling people to go to their insurance companies. Many people are unable to afford insurance. Why is our Liberal provincial government not giving any support in this area? That same comment about the culvert replacement concerns and residents' knowledge being pooh-poohed was also relayed by completely different people who live in the area. 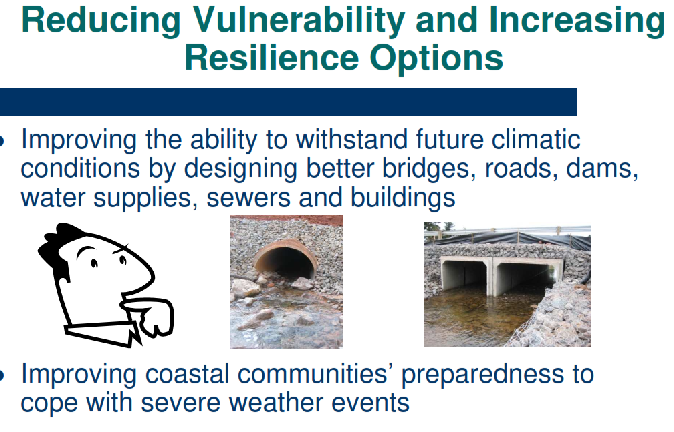 Many watershed groups have been talking about improving infrastructure to deal with climate change for some time now in relation to the waterways and roadways in their areas. They are in a difficult position - TIR provides and installs culverts, so what watershed group wants to go out of its way to be critical of government? Not an ideal situation. CBC Radio has an article this morning about Keith Kennedy, a Charlottetown resident and businessman who is seeking the Liberal leader nomination. He plans to visit 27 electoral districts to raise awareness of issues, to get the number of signatures required, and to raise the $2500 entry fee to join the contest. 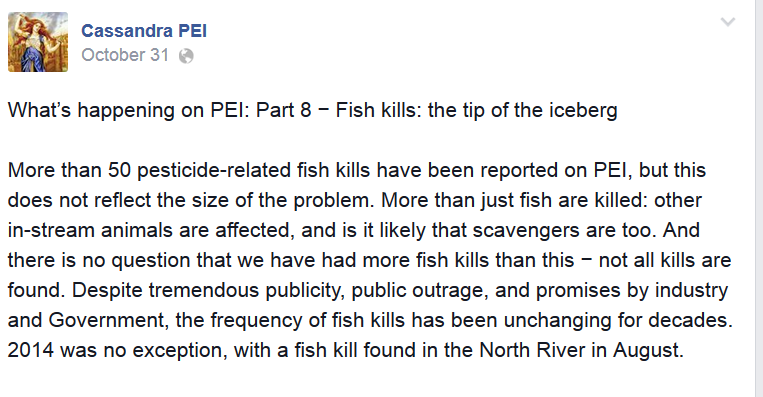 He was in District 27, Tignish-Palmer Road, last week. The deadline to enter is January 20th, 2015. 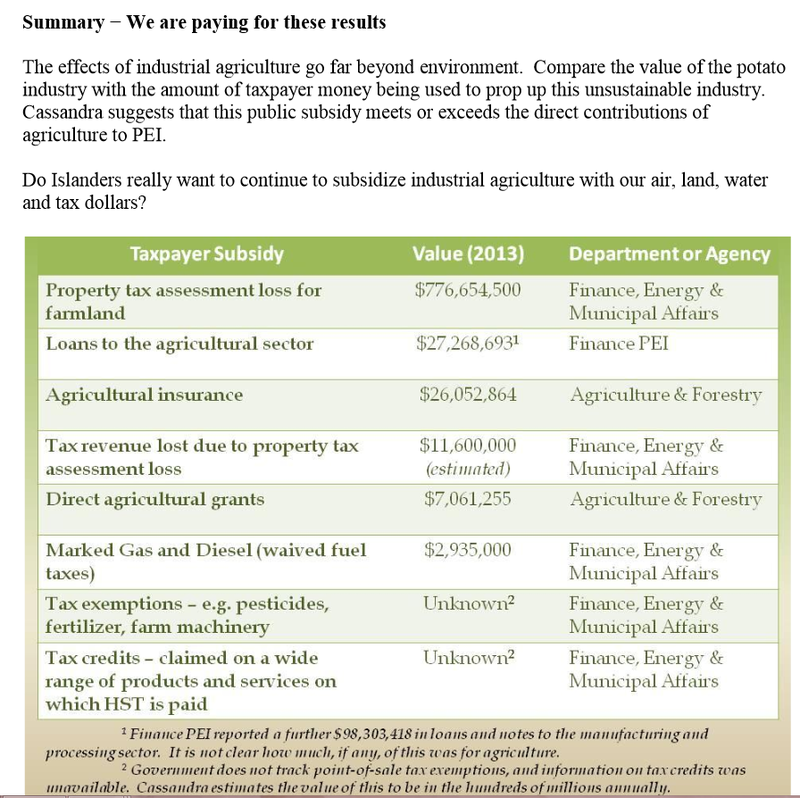 A quick sum of the values they list is over $850million dollars of government subsidies, and I think the chart is to remind Islanders how much the province is investing (either directly or by tax breaks) into industrial agriculture. 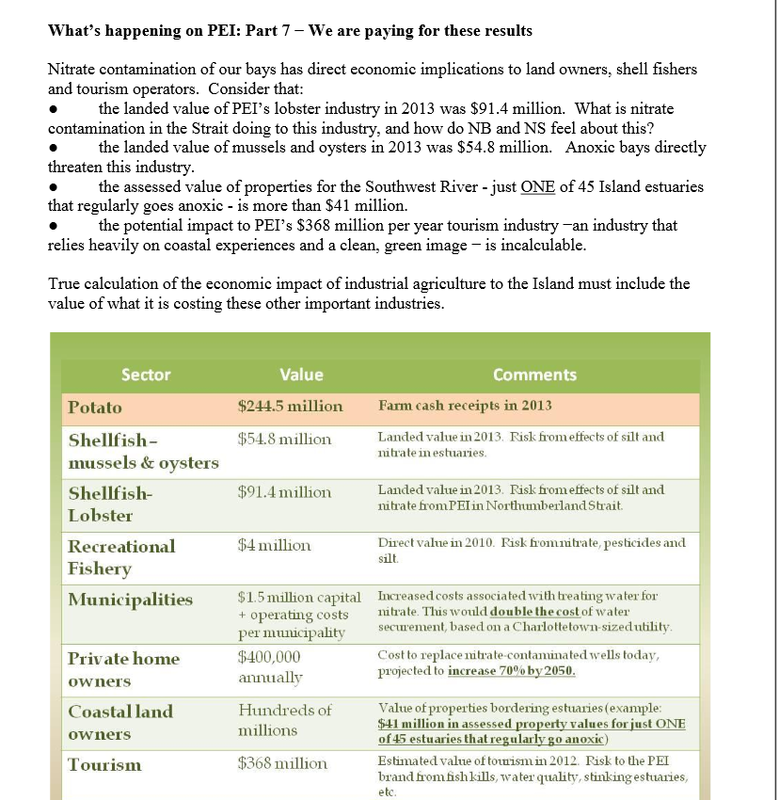 Perhaps this is to balance what appear to be inflated figures various groups claim their industry contributes to the Island economy., claims which don't take these into account. The next couple of years promise to be an interesting period in Island politics — a time, perhaps for new beginnings and initiatives. Both the Liberals and the PCs will have fresh leadership; the Greens and the NDP already have capable “newish” leaders in place. Wouldn’t it be great if all four parties were represented in our Island Legislature? And that brings me, again, to the issue of electoral reform. Might it not be time to revisit that issue – one in which the Island was once seen as a leader in Canada. Next year will mark a decade since our 2005 Electoral Reform Referendum. Perhaps Islanders might now see the wisdom in a reform less radical than that proposed 10 years ago. As a start in this discussion, I suggest that we revisit a research paper written by Andrew Cousins in the year 2000, for the Institute of Island Studies (you can find it on-line at upei.ca/iis). Mr. Cousins suggested a supplementary electoral system, with 20 members elected “first-past-the-post” (like at present), in 20 constituencies. To these would be added 10 supplementary members, elected from party lists, on the basis of the province-wide vote. For each 10 per cent of the vote, an individual from a list would join the Legislature. There could be many variations to such a system, with provision made, for instance, that there be an equal number of women and men elected from the lists, as well as for even geographical distribution, and so on. There would be two major advantages to such an electoral system: 1) it would assure a reasonably strong Opposition in the Legislature, comprising at least four or five members; 2) it would give both the NDP and the Greens a very good chance of electing at least one member, province-wide. At the same time, it would provide stability — as well as a higher degree of proportionality. 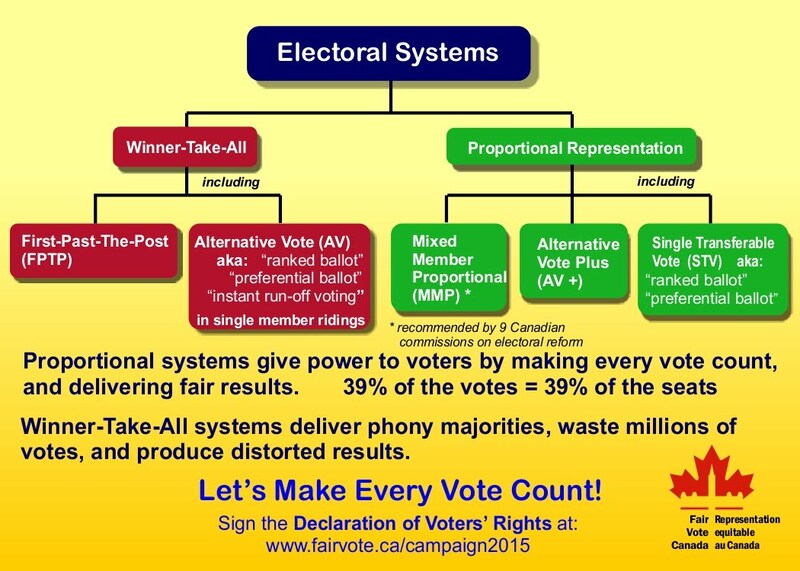 Even a relatively modest change, like this one, would place us in the vanguard of electoral reform in Canada. The Cassandra PEI reposting is short today, and after numbering up to Part 11, they stopped; but I will continue to number them to help reference them. It is from November 4th, originally. It was lovely to see Todd and Savannah and copies of Global Chorus at the Charlottetown Farmers' Market yesterday. They will be there next Saturday, and Monday night at Receiver Coffee shop on Victoria Row. Yet again, I incorrectly called Savannah Belsher-MacLean by the wrong name Susannah in yesterday's post. I am sorry; I blame the Solstice Brain. Some letters of note recently in The Guardian,bold is mine. The first was published just before the Climate Change conference in Peru began. The recent huge drop in the price of oil is certainly a benefit to many hard-working Islanders struggling to heat their homes and drive to work on low wages. We don’t know how long this trend will continue, but it already has had a huge effect on government revenues. If it does continue downwards for some time, the implications are sobering for a country that has put most of its economic eggs in one basket. Large numbers of job losses in the oil patch would have a domino effect on the whole country, and the government’s ability to provide the services we need while achieving the much-vaunted surplus will be at risk. In this environment the Prime Minister has declared that it would be foolish for the country to adopt climate-change measures which would, in his opinion, cause havoc and cost jobs. How wrong he is. In many countries, and in the province of British Colombia, where measures have been taken to cut emissions of green house gases, economic growth has returned. Sadly Mr. Harper can’t see past the oil patch, he doesn’t want to understand the number of jobs that can be created in moving away from oil and coal towards a carbon-free economy. I would encourage my fellow citizens to sit back and imagine what it would be like to have every home heated by heat pumps, every car an electric vehicle, and most journeys a ride in a modern high speed electric train. Solar, wind and yes nuclear power systems are rapidly getting cheaper and more efficient. The problems with nuclear energy are more political than technical, as this system is the only one proven to be capable of providing the huge base load electricity system that is needed right now. It will be interesting to see what kind of reception Canada and Australia, two nations emerging as international pariahs, are given at the climate summit in Peru. I will be voting PC in the upcoming election because the Liberals couldn’t balance a budget. It costs Islanders $100 million a year to pay the interest on our debt. That money could be used to double our spending on community services and seniors, or give every Islander a $1,000 a year. We cannot continue to pass this debt onto children and the unborn. Some argue we need to deficit-spend to stimulate the economy during hard times. I argue that we can save for it. My only other hope is that the PC leader that is chosen agrees that the province is over-drawn financially and environmentally. Our natural capital has largely been spent. Just as we need to repair our bank account, we also need to repair our biodiversity, fish populations, forest quality and soil quality. These resources have been steadily spent over the past 500 years, and in my opinion, they’re better than money. Best wishes to all the candidates, and here’s to a vision we can all aspire to, a debt-free province bursting with life. And to end wiht some humour -- this letter was in response to an op-ed piece by the Fraser Institute, I think, about the need for a continued fossil fuel economy. In response to Ben Eisen and Mark Milke's piece in the Guardian on Friday, Dec. 12, I have to agree that it's pretty nuts that Nova Scotia and New Brunswick continue to ban fracking. Pretty nervy of them, still taking equalization from the rest of the country while selfishly insisting on having clean, non-flammable ground water. For shame, N.B. and N.S., for shame! And think of the side benefits to citizens they are turning up - you just have to turn on your tap and light up, that's free heating in the winter. That's got to help the economy. Pauline Howard of the Food Exchange PEI reminds us that today is the last day that Arlington Orchard's fruit stands in Charlottetown (the small bright yellow log building in Ellen's Creek shopping strip mall) and along the highway in Miscouche will be open. 9AM to 5PM. The Farmers' Market in Charlottetown is open today from 9AM to 2PM and the one in Summerside from 9AM to 1PM. Charlottetown's is open Christmas Eve Wednesday, but I don't know about Summerside's. Author and now Liberal Party of P.E.I. leadership candidate Wade MacLauchlan was in front of the inside entrance to The Bookmark Friday afternoon signing copies of his book about former Premier Alex Campbell. Small Island, as they say. This is sad/funny -- really, his biggest mistake? 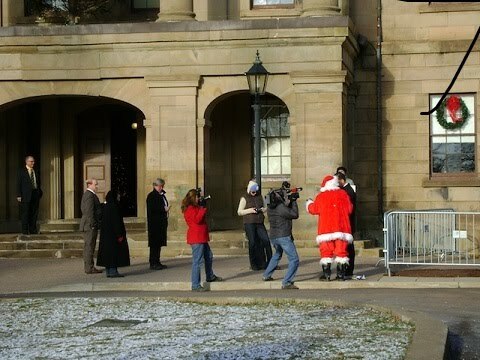 Maybe he should listen to the NDP PEI's "12 Days of Christmas: The Liberal Edition" song* for a better list. Hint: initials! Perhaps taking in lots of money via all those initials and new taxes, and still leaving the job with over two and half billion of debt, might be the biggest mistake. The end of year interview, usually a cozy affair, seems a bit overblown this year. On a different level of government, there are comments about the softball questioning Peter Mansbridge from National CBC did in an exclusive interview with Prime Minister Stephen Harper. Green is more recent, red is late 1990s-early 2000s. 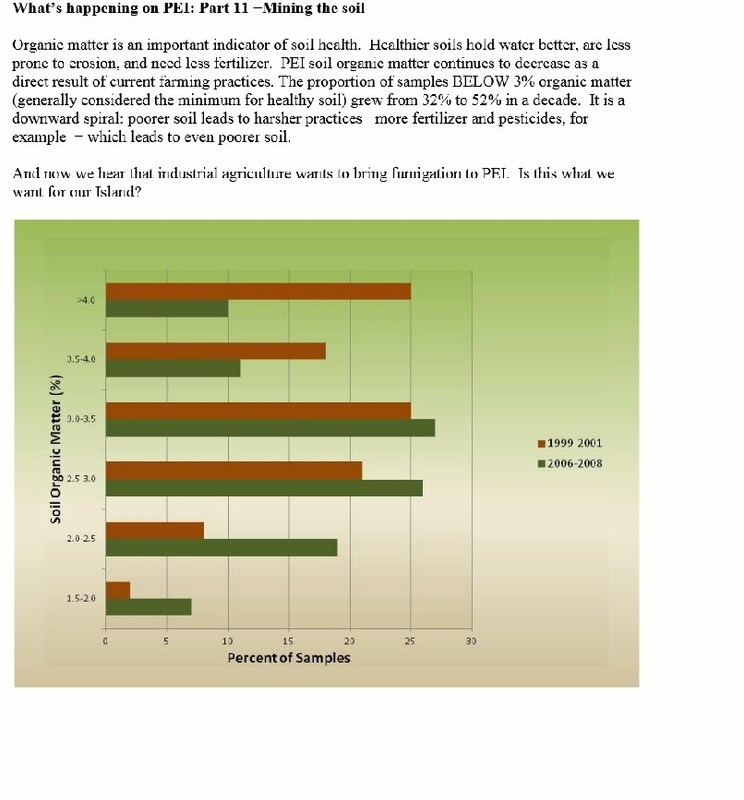 A greater number of soil samples have smaller percentages of organic matter. I found that Minister Sheridan’s response to the recent price drop in crude oil exemplifies government’s inability to include the environment in its equations. Higher oil consumption is not simply a matter of short-term ease of pressure on the consumer or maintaining the flow of tax revenue at current levels. Climate change and the environmental degradation associated with our dependence on fossil fuels is a reality. Government has shown little interest in acknowledging this, and no significant leadership toward the development of any alternatives. Once again, the partisan spreadsheet takes precedence over sound planning that goes beyond the next election. Is there any reason why some of this revenue can’t be re-allocated towards conservation initiatives, Island-wide public transit, and other programs that benefit the people and the health of the environment? Despite the Guardian’s view that this issue only makes “environmentalists wring their hands,” it should be a concern to us all. that "acceptable" 7 tonnes per hectare is equal to about 6,300 pounds per acre. That's about 80 feed sacks (of 80 pounds each) of soil per acre each year. The high end of the estimate of *actual* soil loss is ten times. Of course, not every field is losing that amount, but ones like this, not covered with an early blanket of snow, are losing soil; and that's affecting everything from streams and watersheds to harbours. A Christmas to Remember Concert, with Joey Kitson, Catherine O'Brien, Don Fraser, Alan Buchanan and others, 7:30PM, Harbourfront Theatre, Summerside, $25. Stringing Strings with Nils Ling and Courtney Hogan, Bonshaw Hall, 7PM, $10. New York has decided to extend its moratorium to a complete ban on hydraulic fracking. Governor Andrew Cuomo, the son of former governor Mario Cuomo, appears to follow in his father's footsteps of listening to his constituents, asking for broad and deep analysis of current information, and leaning towards the more environmentally-conscious decision. The southern tier (the western arm of the state) is connected to the Marcellus Shale formation (exploited in other parts of the U.S.), and it is a beautiful place of quiet lakes, rolling hills and small towns; there are lots of economic pressures to open the state for fracking. Albany, N.Y. -- New York state's environmental commissioner said today he will ban fracking in New York. DEC Commissioner Joseph Martens said a five-year study by DEC on fracking will be released next year. "I will then issue a legally binding findings statement prohibiting (fracking) in New York state at this time," Martens said at Gov. Andrew Cuomo's year-end cabinet meeting. Martens made his announcement after a detailed presentation by state health commissioner Howard Zucker, who concluded that he would not allow his family to drink tap water in an area where fracking occurred. "I cannot support (fracking) in the great state of New York," Zucker said. Zucker said studies showed harmful health effects from fracking, and there were not enough long-term studies to show the effects over time. "The bottom line is we lack the comprehensive longitudinal studies, and these are either not yet complete or are yet to be initiated," Zucker said. "We don't have the evidence to prove or disprove the health effects. but the cumulative concerns of what I've read gives me reason to pause." Martens had few good things to say about fracking in his 10-minute talk. He listed a variety of potential environmental effects, from pollution of groundwater to release of methane and ozone. He also said that more than 63 percent of the possible land area on which fracking could occur in the deep Marcellus shale in New York would be off limits under state rules and local zoning. Given those restrictions and the low price of oil and gas now, Martens said, fracking would be unlikely anyway. And in case you want a refresher on fracking and its concerns, albeit not a very industry-friendly one, here is a 2:30 minute animation from the Sierra Club, narrated by actor Edward James Olmos. 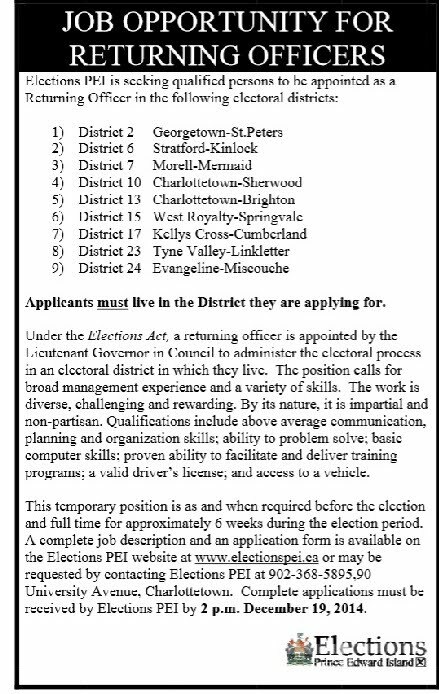 With a possible provincial election coming up, Elections PEI is looking for district returning officers. You must be 18 or older, a citizen of Canada, and *live in the district*, among other prerequisites. The deadline is tomorrow at 2PM. Watch for the sixth day. 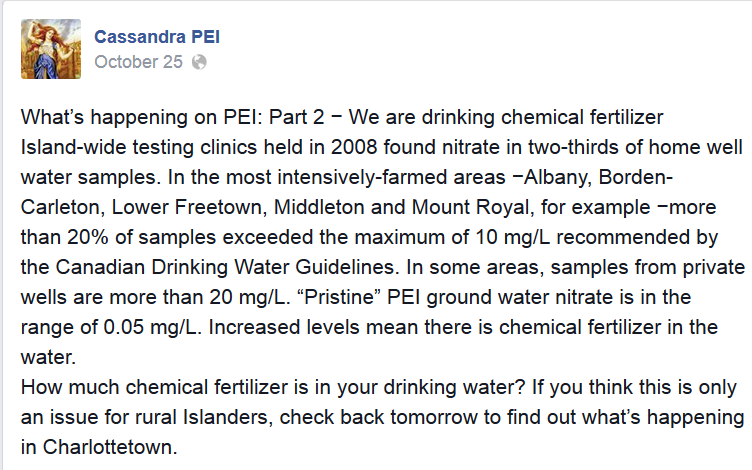 What’s happening on PEI: Part 9 − What’s in your drinking water? 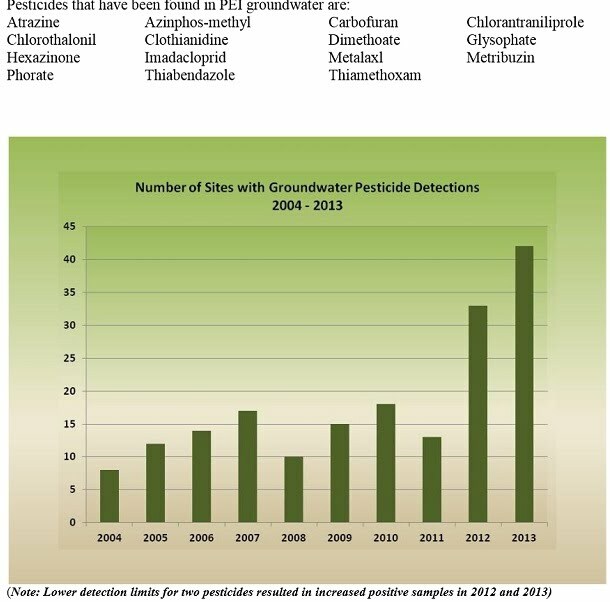 In addition to being washed into streams and rivers, pesticides also end up in our groundwater. schools and three seniors homes. Now, the Cassandra people are the first to admit that more sensitive testing added to the increase in the last two columns, but still, it is a worrisome, worrisome trend. 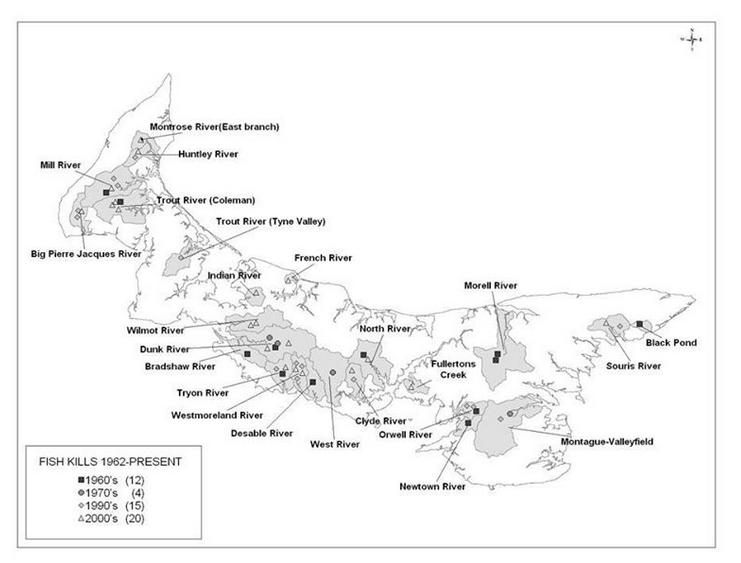 Since the June announcement, there have been the usual seasonal anoxic events in Island estuaries, and a major fish kill in the <North River> watershed (the final report of the investigation into which has yet to be released). As late as last week we were reminded of the vulnerability of our watersheds, as heavy rainfalls caused flooding, wide-scale destruction of infrastructure across the province, significant run-off from fields and roads and siltation in most of our waterways. Here, by the way, is what is said about the Water Act in the Speech from the Throne, which was read on November 12th, 2014. I know the Premier retreated the next day, and most elected officials in government are shrugging and saying, "The new Premier will have to decide" about pretty much everything, but folks behind the microphones are obviously still going to their offices and working on projects and policies. I sent this link a while back, and it is pretty depressing reading. That's the latest on the website, so I don't know if the final report (with any sort of toxicology) has been released from the Department of Agriculture and Forestry's Fish and Wildlife division. Lord, What Fools! plays at the Victoria Playhouse on Thursday night (December 18th, 7:30PM), Saturday afternoon (2PM), and Saturday night (December 20th, 7:30PM). Tickets are $20 for people 15 years and older, $10 for under 15, $40 family rate. After expenses, the proceeds are going to a scholarship in memory of Victoria Playhouse legend Erskine Smith, who directed the first go-round of this play ten years ago. The folks in the cast and crew are "Lord, What Lovely People!" Call (902) 658-2025 for tickets. Over a week ago I mentioned that Conservative MP Michael Chong's bill to reform certain aspects of political parties was at a committee and Matthew Carroll of Leadnow Canada was invited to present. He did a snap poll of Leadnow subscribers to get some numbers of support and a gauge of issues. He wrote Friday night (December 12th), with a newsy, detailed account of what happened, and what he said, and I have posted his letter (below). I wanted to quickly follow up on the survey you completed about the Reform Act. Thank you so much for taking the time to share your thoughts at short notice. Over 4,000 of you responded, and on Tuesday last week I went to Ottawa to present to the Standing Committee on Procedure and House Affairs (PROC), the committee that's currently holding hearings into the Reform Act. It was so great to be able to tell the MPs studying the bill what our community thinks about reforming our democracy - not just my own ideas. Thank you especially to Bruce, Lori and Catriona, whose individual comments I quoted from. Many of you sent in such thoughtful comments, and I wish I'd had time to read more of them! We've been to parliament a number of times for Leadnow's campaigns - to deliver petitions, give press conferences, and meet with MPs - but this was actually the first time we've been asked to formally present to a committee. It was a fascinating experience. The government MPs sat on one side of a huge rectangle of tables, opposition MPs on the other side, with the chair of the committee at one end and the "witnesses" at the other. Along with myself, representing the Leadnow community, three other witnesses were there: Lori Turnbull, an Associate Professor at Carleton University; Former Speaker of the House of Commons, Hon. Peter Milliken; and Ned Franks, Professor Emeritus in Political Studies, Queen's University. First we all presented a short opening statement (and you can read my remarks below at the end of this email), then the MPs asked questions. It was a thoughtful discussion of the merits and challenges of various parts of the bill, which tries to restore more power to MPs and local ridings, while balancing the needs of the parties centrally. What surprised me most was how different it was to the hyper-partisan and confrontational nature of - for example - question period. I think in part that's due to the hard work of Michael Chong, the Conservative back-bench MP who introduced the bill and has worked to build cross-party support for it. I wish more of our politics could be deliberative and thoughtful, rather than brash and confrontational; perhaps the Reform Act will be a first step in the right direction. It will be interesting to see where the bill goes from here. Thank you again for your feedback, and we'll be in touch soon. P.S. If you're interested in more details, below you'll find links to the audio recording of the hearing, and also the official transcript, as well as tweets from the CBC's Kady O'Malley who was covering the hearing and my opening remarks. Good morning everyone, and thank you for inviting me. I'll say a few words about Leadnow in just a moment, but I'm going to begin with a couple of quotes. "I'm tired of the MP for my riding being the representative of his party in his constituency, rather than my representative in Ottawa." "I've had enough of MPs waving talking points rather than debating issues and working together to resolve them. I want my representatives to work together for the good of the country NOT the good of their party." Leadnow is an independent advocacy organization. We're working to bring Canadians together from coast to coast, and across party lines, to take action on the issues that matter. Since our launch just before the last federal election our online campaigning community has grown to include over 360,000 Canadians. Together, through online consultation and face-to-face gatherings, our community has decided to focus on three areas: building a fair economy, action to protect our environment and address climate change, and democratic reform. What we keep hearing over and over again from our community is a grave concern about the state of our democracy, as well as a deep desire for positive change. Democracy isn't an end in itself, it's a means by which we can come together to make progress on the major challenges we face as a society, and that's why when Mr Chong introduced the reform act, we felt compelled to act. There are issues that we believe Canadians want to make progress on, but the reality is that action to improve the functioning of our democracy and to empower MPs to better represent their constituents truly cuts across all issues and cuts across all party lines. Over 26,000 Canadians have now signed on to Leadnow's campaign in support of The Reform Act. Yesterday I sent out a survey asking all of them for their opinions on the issues this bill encompasses, as well as their thoughts on democratic reform more broadly. In just a few hours, over 3,000 had responded. That's where the quotes I opened with come from - the voices of regular Canadians across the country who care about these issues. These are Canadians who self-identified as being supportive of The Reform Act, as opposed to a random public poll, but I do believe it will be useful to the committee get a sense of the reasons why many Canadians support the bill. First we asked about the freedom MPs have to represent their constituents over the interests of their parties. 91% told us it is "very important" for MPs to be able to disagree with, speak out, or vote against the official positions of their party. One of the issues we've seen debated within the context of this bill is the ability of parties to ensure a diversity of Candidates. That's a goal that is in tension with the aims of increasing MPs' freedoms to represent their constituents. Despite that tension, it is something that is important to the Canadians we surveyed: 75% said it is very important for parties to be able to ensure a broad diversity of candidates. My understanding is that Mr Chong's latest proposed amendments would give each party the power to decide what mechanism it puts in place for the approval of candidates. We asked people who they thought should have the final say in whether a candidate gets to run for a party. This was more varied, but 53% said it should be the sole control of the local riding association. 37% were in support of regional nomination officers, chosen by the local riding assocations. Only 6% were in support of nationally appointed nominations officers, and less than 2% believe the status quo of the party leader signing nomination papers is a good idea. The last point I want to make is that while we believe the Reform Act is a useful first step towards democratic reform, and one we very much hope to see passed into law, it is just that - a first step. We have a very, very long way to go if we're going to meaningfully restore Canadians' confidence and trust in our democracy. At the end of our survey we asked what other reforms - that are outside of the scope of this bill - they would support. It's notable that over 96% believe our current first-past-the-post voting system is broken, and that we need electoral reform. "I believe the Reform Act is extremely important. I also very much want to see Proportional Representation brought into our voting system." On behalf of everyone who signed on to our campaign, thank you again for inviting me this morning, and I look forward to the discussion. 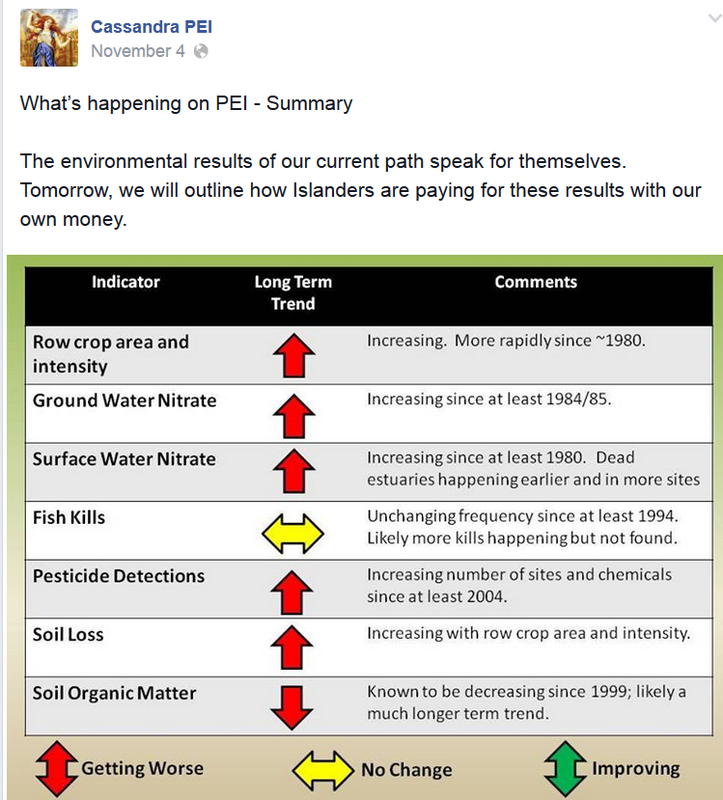 Cassandra PEI -- a chart from October 29th, 2014: "What's happening on PEI: Part 6 -- What happens here does not stay here." This shows two consecutive years of research measuring nitrates (in kilograms of nitrate per hectare, measured in watersheds for each year). 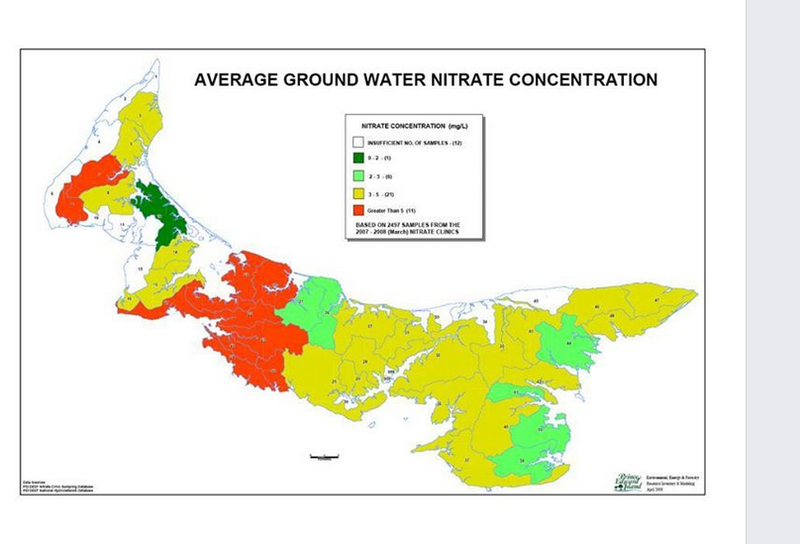 PEI's nitrate run-off is getting into the Northumberland Strait and spreading across the Strait to the land in New Brunswick. Joan Diamond wrote a fantastic letter teasing apart the glossy ad for certain types of farming. It is not on the website yet. Who funded the “Real Dirt on Farming?” If you bought a Guardian last week, you were gifted with an impressive 50 glossy-page spread called ‘The Real Dirt on Farming.’ Bursting with stunning photography and well-crafted articles, this magazine assures us that all is well in Canadian farming. As I read through it I tried to imagine what the general population would be thinking as they leafed through its pages. I expect many would feel relief, as it dismissed any and all environmental and health concerns as being an overreaction … that the use of hormones, antibiotics, GMOs and pesticides are necessary and even healthy. Whew, what a relief! But those of us who live in rural areas and witness the consistent degradation of our soil, air, water and health know better. Those people who dedicate their spare time to cleaning up dead fish by the thousands know better too. Anyone who looked beyond the gloss would easily find an abundance of scientific proof that much of this is, well, hogwash. A little bit of digging revealed that the most generous sponsor was Croplife (Bayer, Dow Chemical and Monsanto, et al), donating a whopping $100,000 towards a budget of $350,000. Another level down I found the Council for Biotechnology Information as a gold sponsor. These companies present their own research, which they fund as well. So although assurances are given that the PMRA and Health Canada wouldn’t condone these chemicals unless they were perfectly safe, I encourage Islanders to do some critical thinking. Ignoring studies advising us of the health and environmental dangers of our addiction to pesticides goes against our basic human right to a healthy environment. The assumption that governments’ primary concern is to protect our health and not the pockets of multinational corporations is naïve at best. I encourage readers to do their own research. Here is a tidbit from mine: ”Any politician or scientist who tells you GMOs are safe is either very stupid or lying.” - David Suzuki. That little footbridge, enjoyed by walkers, hikers and mountain bikers very much until recently, has quite an interesting history. On almost every Island stream where the tide reached furthest inland there was once a mill and a millpond. 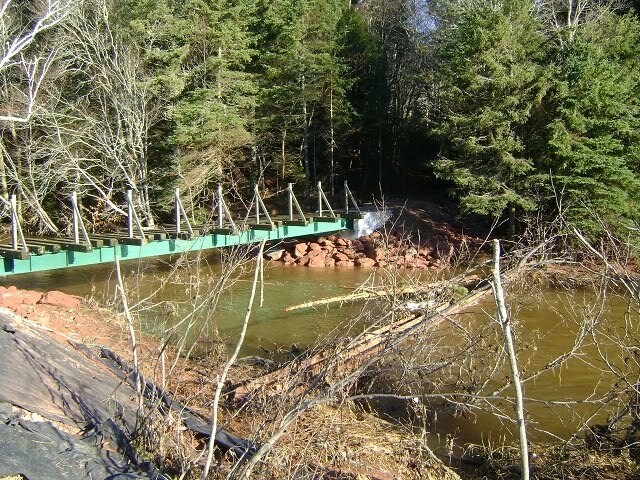 Many have disappeared but on the West or Eliot River the site of Crosby’s Mill can still be found. The Green or Tryon Road which was cut through in the earliest years of the 19th century crossed the West River at the head of tide and in the early 1840s a mill site was developed just above the bridge. The steepness where the road dipped into the valley from the heights of Strathgartney was a difficult climb for heavily laden wagons and carts and in 1841 an alternate and more gradual route was developed just to the south at Bonshaw. It's almost hard to believe, but the road to Bonshaw was actually what some of us are calling the Crosby Road that came from the old TCH by the Bonshaw 500 go-kart place and went down and over a bridge and continued on what is now called Green Road. The steel span was in place until 1962 when it was washed away and floated down to Bonshaw. 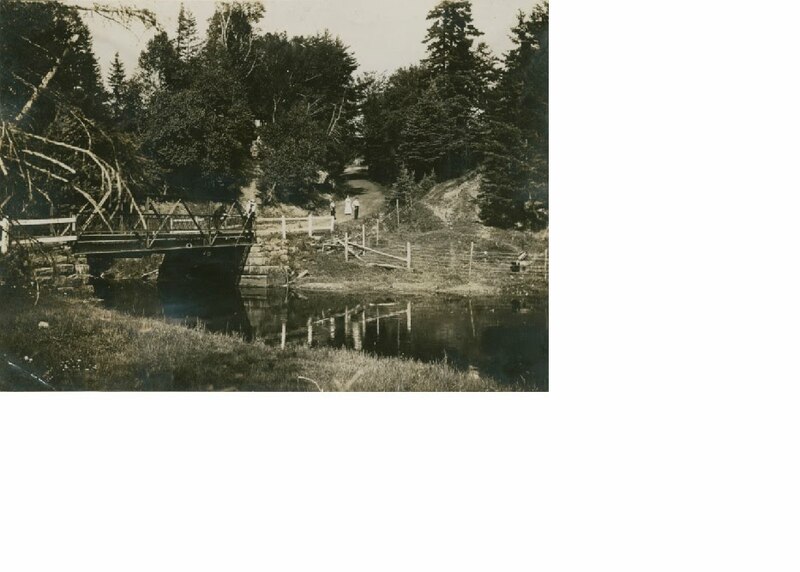 A temporary foot bridge using decking over two telephone poles provided access to the eastern bank of the river. with the new bridge (not yet done) above the water, and the i-beams --all that is left of temporary bridge -- blocking a few snags. 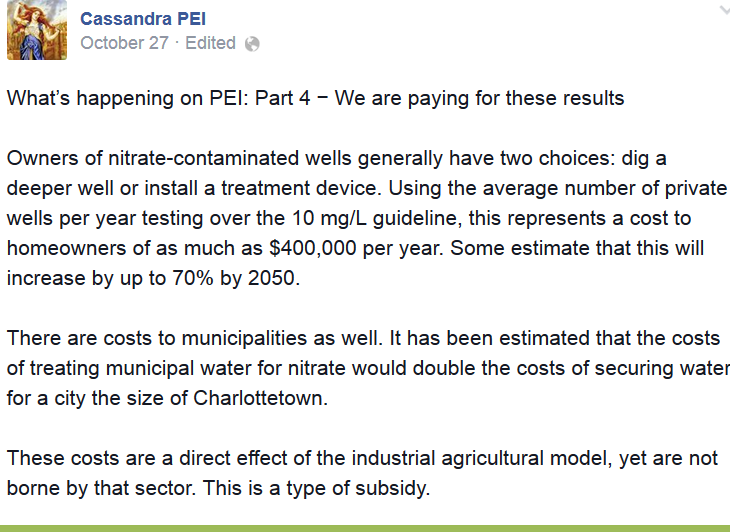 Screenshot of text and copy of photo from October 28th, 2014, posting on Facebook by Cassandra PEI, of text and a photo of anoxic conditions on a P.E.I. waterway (I am not sure of location). Sea lettuce may be found attached to rocks and shells by a holdfast, but it is also commonly found free floating. Among the most familiar of the shallow water seaweeds, sea lettuce is often found in areas of exposed rocks and in stagnant tide pools. Sea lettuce has also been recorded at depths of 75 feet or more. Sea lettuce grows in both high and low intertidal zones and marshes throughout the year. Tolerant of nutrient loading that would suffocate many other aquatic plants, it can actually thrive in moderate levels of nutrient pollution. Large volumes of sea lettuce often indicate high levels of pollution. Growth is also stimulated by the presence of other pollutants. It is often found in areas where sewage runoff is heavy. As a result, sea lettuce is used as an indicator species to monitor pollution trends. The density and location of this alga can often indicate the presence of high amounts of nutrients. In areas where there is a high concentration or "bloom" of sea lettuce, sunlight is unable to reach submerged vegetation such as eelgrass, preventing photosynthesis and often killing the vegetation below. When sea lettuce dies, bacteria feeding on the decomposing sea lettuce use up a tremendous amount of oxygen in the water. This, in turn, depletes the oxygen available to other species, suffocating or driving them away. Masses of sea lettuce can hamper swimmers and foul lines and fishing nets, but it does provide a home to some small invertebrates such as amphipods. Like lettuce grown on land, it can be used in salads and soups. Sea lettuce is also used to make ice cream, other food products, and medicine. Screenshot from Cassandra PEI's Facebook page. This, to me,the following is one of the better descriptions of some of the health issues of nitrates in our drinking water. Bold is mine. The methemoglobinemia hazard from drinking water with nitrate-nitrogen occurs when bacteria in the digestive system transform nitrate to nitrite and the nitrite oxidizes iron in hemoglobin of red blood cells to form methemoglobin. Methemoglobin lacks oxygen-carrying capacity and the condition known as methemoglobinemia occurs. Because infants under six months of age have a higher concentration of the digestive system bacteria known to transform nitrate to nitrite, and a lower than normal concentration of the enzyme known to reduce methemoglobin back to hemoglobin, they are at higher risk for methemoglobinemia. Consuming water from a source containing 10 or less mg/l nitrate-nitrogen provides assurance that methemoglobinemia should not result from drinking water. Consult your physician for information on methemoglobinemia or for professional diagnosis if methemoglobinemia is suspected. Methemoglobinemia (too much methemoglobin in the blood) is sometimes called "Blue Baby Syndrome." Note that the risk to infants is if they are fed formula mixed with water high in nitrates. I have found no suggestion that breastmilk from mothers who are drinking higher nitrate water results in methemoglobin in her baby. Most public health agencies list the "safe" level as 10 mg/litre, which is Health Canada's threshold, but it seems so very high.... and one wonders about other vulnerable populations, such as the elderly. Also, there are concerns about increased rates of certain cancers in people who are exposed to higher concentrates of nitrates in their water. Cassandra believes the current agricultural model has been subsidized with our money, our people and our environment for too long. Drinking water contaminated with pesticides and fertilizer, dead zones in coastal estuaries, fish kills, impacts on other industries, and suspected links with human health are all outcomes of these subsidies. The group notes that industry is now asking for further subsidy in the form of increased access to a public resource −water. They say further requests, including soil fumigation, are on the horizon. 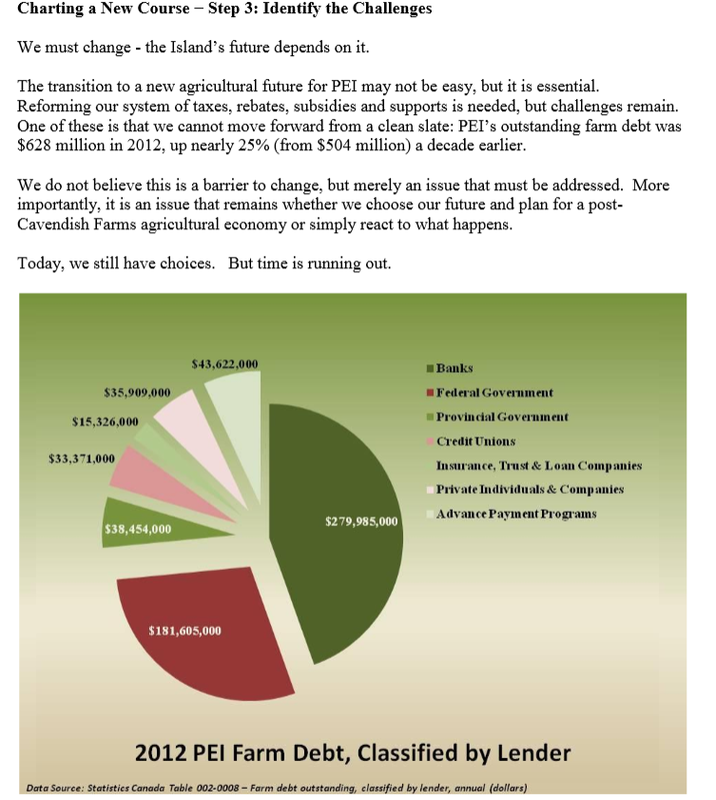 • describe solutions that can create prosperity and true sustainability for PEI. 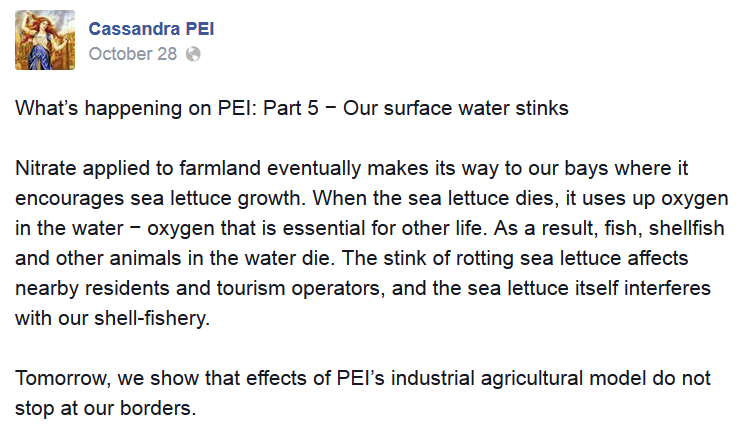 Cassandra believes that PEI’s potato sector is tremendously vulnerable. Whether it be Cavendish Farms pulling out of PEI, changing markets or competition from elsewhere, the group says the writing is on the wall. The choice is simply to prepare or react. 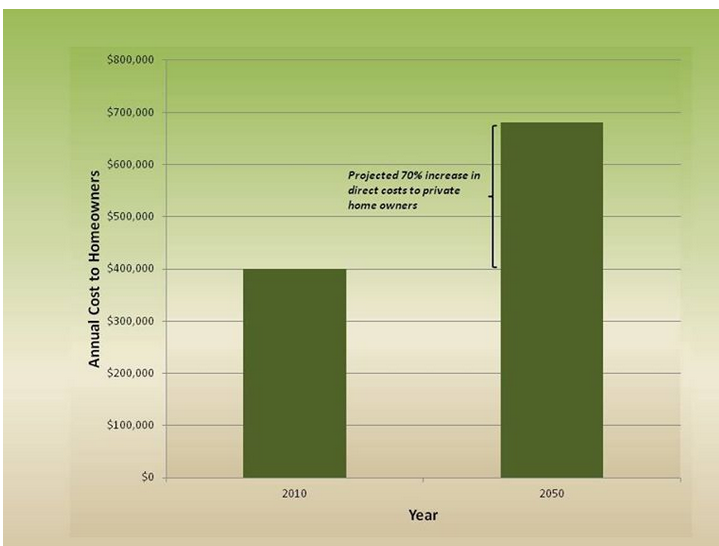 Admittedly, this is one of the less impressive charts (I say that since I am not sure if I understand it), but I gather the point is that a homeowner is going to pay if he or she has high nitrates in a household well. Occasionally, there are free testing clinics, but water filter systems are not cheap. 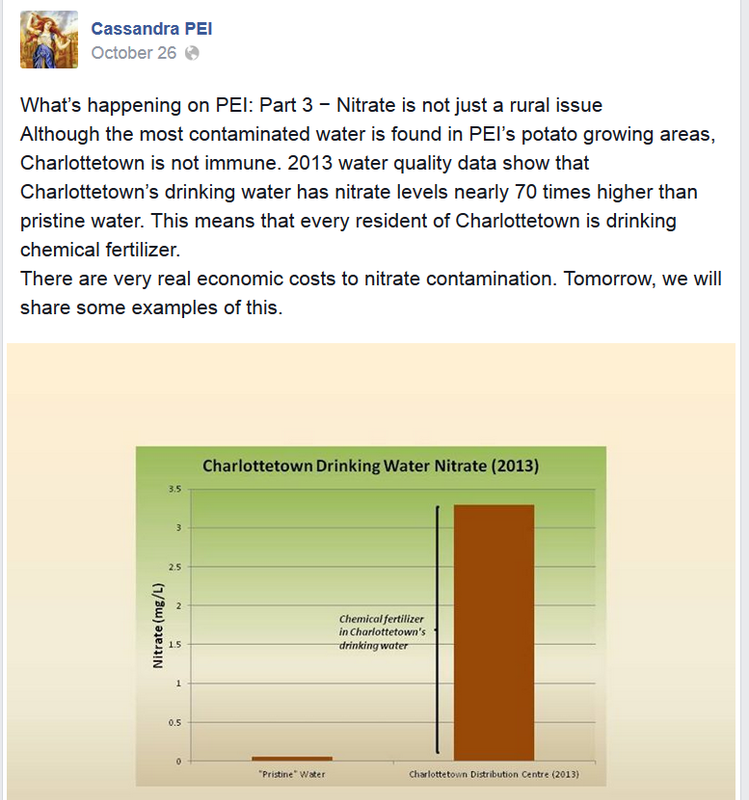 The point is that nitrate concentrations are high in P.E.I. drinking water, it's likely both spread across regions and very focal in some areas, and it's very likely the nitrates are due to heavy fertilizer use. It's also insulting to see poor decision making causing harm to what was a stable area in the Bonshaw hills that was able to deal with excessive rain and snowmelt, but is now "Plan B's Drainpipe." 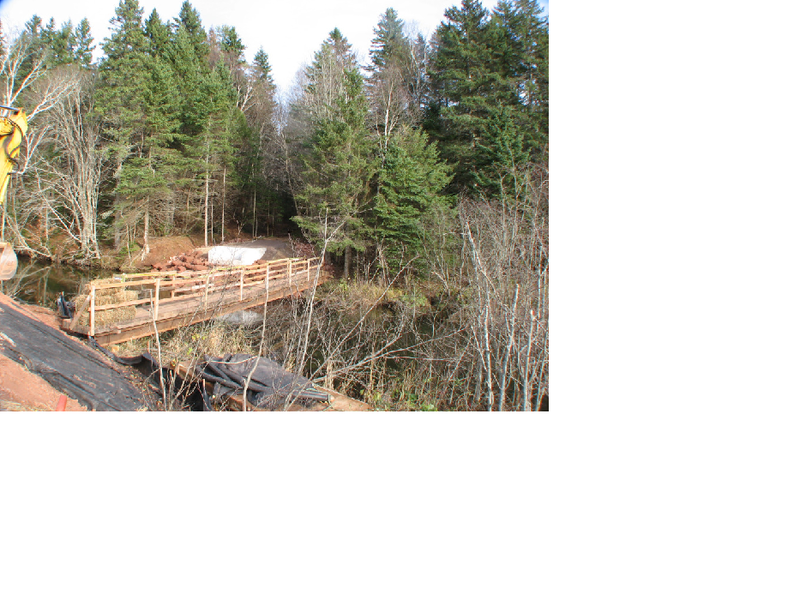 Footbridge (under construction), at Green Road and Crosby Mill area, Thursday, December 11th, 2014, about 9AM. The water flow entering the river at centre is nearly entirely due to runoff from the extensive stretch of Plan B asphalt uphill. The local watershed group and others placed all sorts of sediment controls in the ravine in the past few months, but there is a huge amount of water coming off both sides of the highway, under it, and down this ravine. And the brand new footbridge beams are not quite high enough for these big rains or melts. 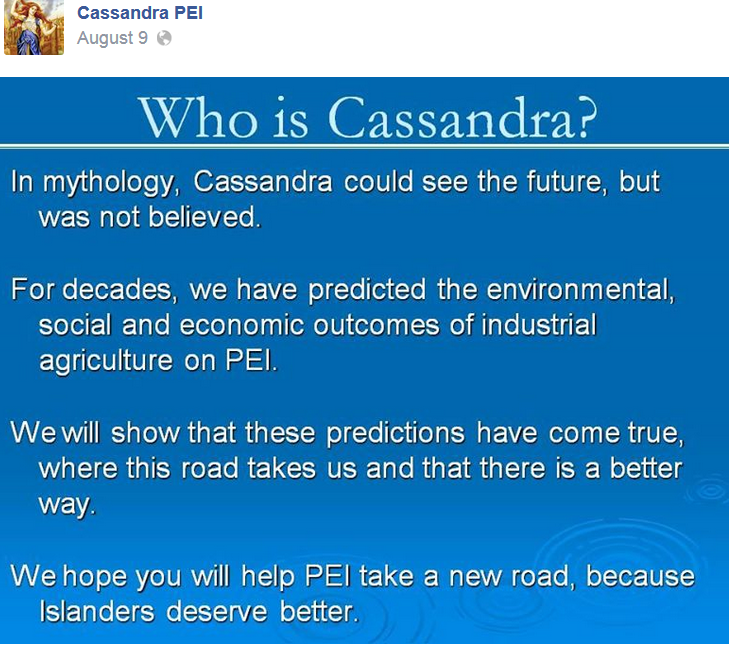 Cassandra PEI, Part 2: After the August posting, Cassandra PEI started daily postings in late October on Facebook. Screenshot from Facebook, Cassandra PEI's page. Nitrate is the name for a molecule that has one nitrogen and three oxygens bonded around it, with a negative charge. It's found in fertilizers (this is over simplifying it but plants absorb nitrogen from the soil as they don't take it from air), which of course is used to push plant growth and increase yields. 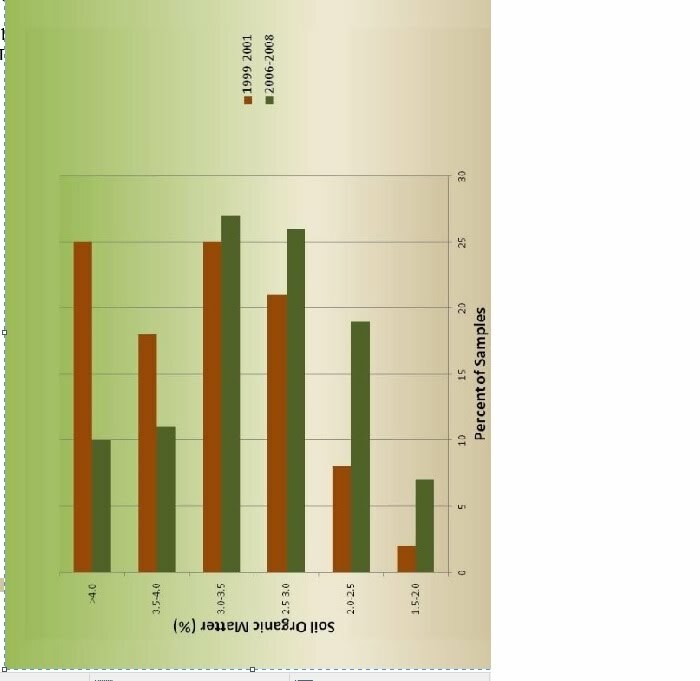 The white areas on the chart are not "pristine"; just not enough samples. Dark green and light are still an average that's more than pristine water should have, and the mustard yellow is up to 5 milligrams per litre; the red is pretty bad with the *average* concentration being over 5mg/litre. "What the government is also not releasing is a study of the nitrates over a 20year period (that shows it) is getting deeper and deeper in wells primarily used in an area of agricultural irrigation. Why aren't they releasing this data? What are they hiding? 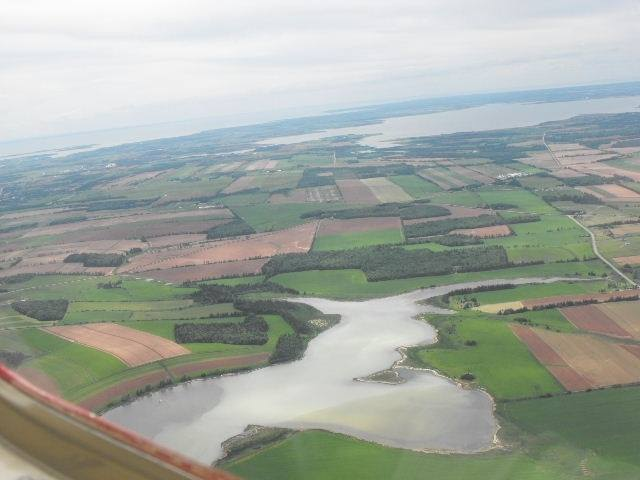 Where is the research on how agricultural runoff affects lobster larva around PEI? What are (they) hiding?" Many "regular" meetings are taking a break for the holidays, and lots of organizations are having holiday socials today and next week. The weekend is filled with concerts and other holiday-related performances. The Community Legal Information Association (CLIA) is hosting an open house at its location at Royalty Centre/House of Sport (the old PVI), 40 Enman Crescent, from noon to 3PM. The now-normal but unusual weather like 80+mm of rain in central P.E.I. in December has caused problems all over the Island, and we'll see what Plan B's run-off mitigations look like in the daylight. The water was lapping the temporary footbridge built at Green Road and Crosby Mill last night. Today is the Voluntary Resource Council's Holiday Social, 3-5PM, VRC Building, 81 Prince Street, Charlottetown. All welcome! The Citizens' Alliance of P.E.I. is a member, which allows us a mailing address in town, some office support like photocopier access, and meeting space in their boardroom. Plus the always-friendly manager Sylvie to chat with. Rob Lantz is expected to announce his candidacy for the leadership of the Island Progressive Conservatives some time Thursday. He will joining Darlene Compton who announced Wednesday, and James Ayward, who announced Monday. A few weeks ago, three folks had a news conference about their evocatively named organization,"Cassandra PEI", which is "Charting a Better Future for Prince Edward Island." The group existed on Facebook, which is cheap and easy to share and allowed some anonymity (and perhaps not a little buzz about who he, she or they could be). (Guardian article printed below.) Three of the members are very respected scientists and naturalists, and caring Islanders, Ian MacQuarrie, Daryl Guignion, and Mike Venden Heuvel. August 9th, 2014. Screenshot from Cassandra PEI. Also from August 9th, 2014 (screenshot by CO). Screenshot from Facebook, August 9th, 2014. This wonderful three-way chart (Charting a Better Future -- get it?) 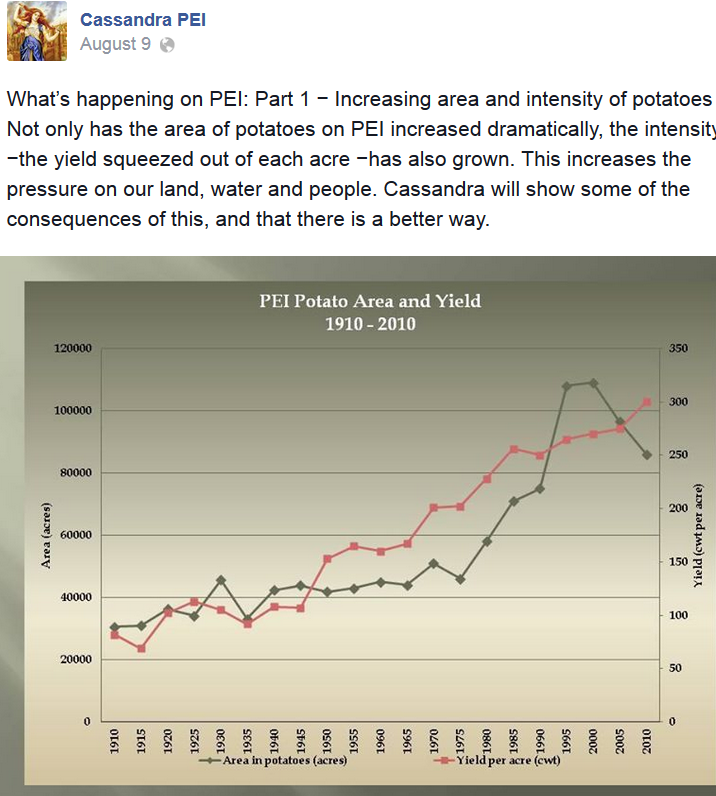 graphically shows the rise in both number of acres planted in potatoes on P.E.I. (green left-hand vertical line numbers) and the rise in number of hundred-pound lots of potatoes ("cwt" for "hundred-weights" per acre of potatoes planted, yield, in red). While the number of acres declined since about ten years ago, the yield has increased. It's not like our soils got fertile all by themselves -- this is likely the result of specific "inputs" like fertilizer and in some cases irrigation. Does this help feed a hungry world? Maybe. So, there may be less acres in potatoes, but each acre is expected to produce more. If people want politicians to act on environmental concerns they need to make it a voting issues, say representatives of a new environmental group. Three members of the group Cassandra held a news conference Friday morning in Charlottetown to lay out some of their concerns about agricultural practices in P.E.I. Mike Vanden Heuvel, a UPEI professor, was one of the members and said he doesn't think any politician will be dismissive of concerns if they think the public will vote based on the issue. "All we can do is try and spread the word and try and present the best information," he said. About 10 people gathered to hear Vanden Heuvel, Ian MacQuarrie and biologist Daryl Guignion talk about concerns over the direction the agricultural industry is headed in P.E.I. Agriculture has a big impact on the environment and the economy, with little done over the years to protect either, the group said. To prove their point the men laid out decades worth of government-commissioned reports they said show a lot of studies have been done over the years with very few changes. Vanden Heuvel said people who aren't involved in agriculture need to think about the industry's impact on the Island. He also encouraged people to contact their MLAs to voice concerns and said the group doesn’t want the message going out to the same people who are always involved in the environmental movement. "We’re trying to find a way to get this message to all Islanders." Guignion said Cassandra members aren't antifarmer, but there has been a lot of degradation of the environment. "I think we have to change the model of agriculture that we have" he said. MacQuarrie said the first goal is to get people in P.E.I. to admit there is a problem. "I think what we're going to try and do is influence other people to look at the problem and see what they can suggest as answers," he said. The next time Cassandra posted was about six weeks later, which I will print tomorrow. Last week, on December 2nd, The Green Economy Network, sponsored by the McKillop Centre for Social Justice and the peerless Mary Boyd, hosted a one-day roundtable and evening public presentation. Here are some notes from the day from Jordan MacPhee, representing ECO-PEI and Transition Island, with thanks for letting me share them. I have edited them a bit for length, and put some text in bold. About 22 people were present over the course of the day, including Tony Clarke (Green Economy Network - GEN), Matthew McCarville (Don’t Frack PEI), and Donald LaFleur (Canadian Labour Congress), along with many other Islanders. The Green Economy Network roundtable was a meeting of individuals from various organizations on PEI who are doing work or are interested in doing work to shift the Island economy toward an environmentally sustainable model. The focus was on ideas to shift our economy to an ecologically sustainable, socially equitable system that provides a living wage to those who are employed in it. Areas of interest were green buildings, public transit, and a particular emphasis on renewable energy development. The Green Economy Network’s (GEN) recent report suggests that a heavy financial investment by government and cooperation between various government levels and sectors over the span of 10 years would create one million ‘climate’ jobs in Canada. Nuclear energy has been ruled out as an option for a green economy by GEN because it creates divides in discussions and doesn’t contribute to successful collaboration between all the different groups necessary. Essentially, issues with divisiveness, international security risks, the disasters at Chernobyl and Japan, and the fact that nuclear energy is not technically renewable since it’s dependent on plutonium which is a finite resource, all culminate with it being an undesirable energy source. Public transit and especially Green Buildings need planning. The provincial government removed a 9% tax on furnace oil, but kept the tax on other heat sources such as biomass. If this tax was re-introduced, 9 cents on every dollar of furnace oil expenditure would be raised for the provincial government to open up an air-sourced heat pump fund so that homes heated by furnace oil can upgrade to air-sourced heat pumps. PEI households consume roughly 160 million litres of furnace oil per year, which would create $10 million of tax revenue per year. There are 40,000 houses in PEI. $10 million being directly transferred into a fund for renewable energy infrastructure upgrades for 40,000 houses equals $250 per house per year. Over 10 years, this would total $2500 per home per year, which would cover the installation of an air-sourced heat pump in every house in PEI. A note: Summerside's net metering program: 50% electricity sourced from wind power. 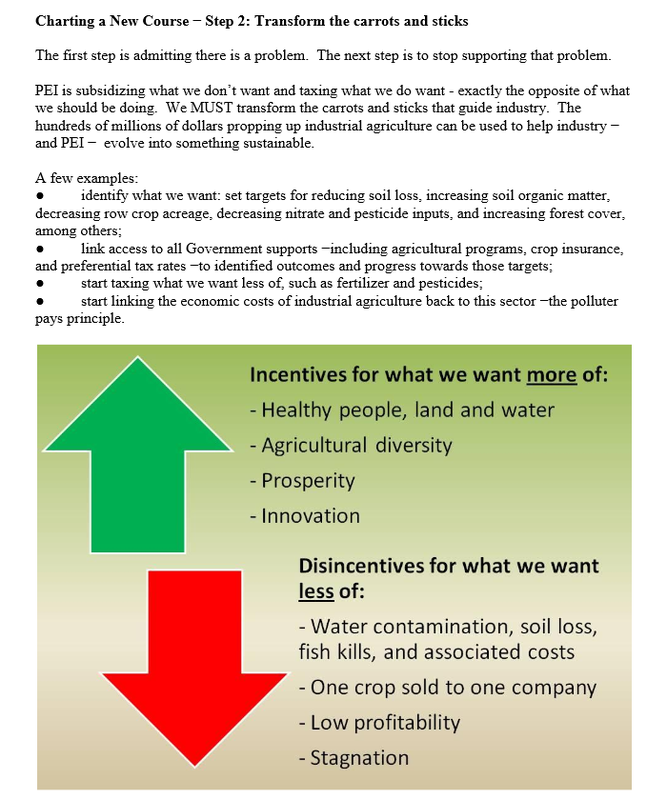 Industrial agriculture on PEI requires too much land and too much capital investment on behalf of farmers for too little profit and too great environmentally destructive consequences. The aging farming population has few aspiring farmers in the younger generations who can realistically afford to buy the hundred or thousand-acre farms for such little monetary reward. 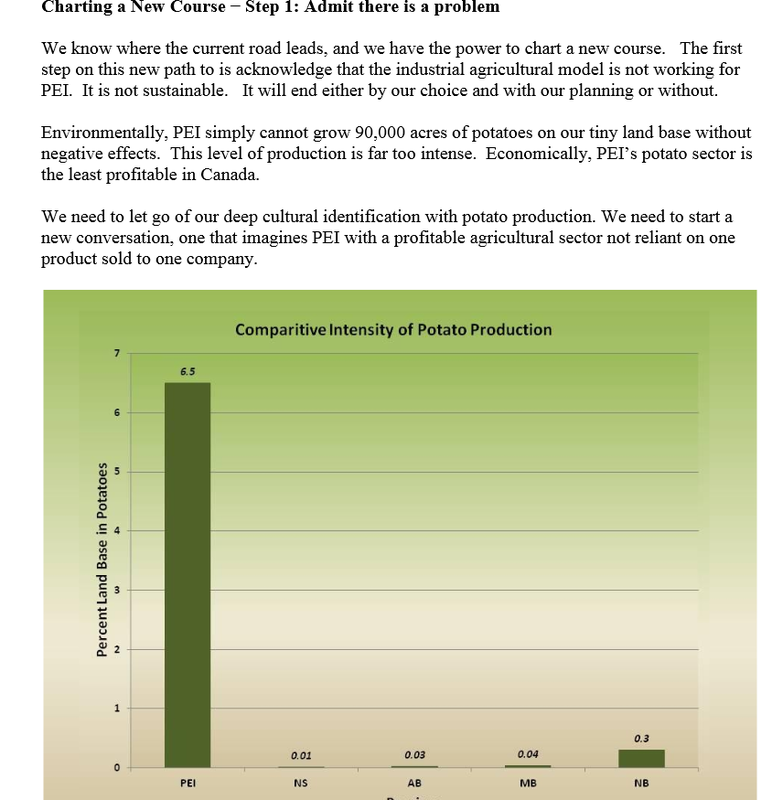 PEI potato production is 40% less efficient than the average yield in other areas. This fall’s Speech from the Throne (November 12, 2014) in the Provincial Legislature mentioned a Farm Funding Program to enable the continuance of the family farm. It will be for farms greater in size than most starting out can afford -- to any young adult interested in starting a farm operation, any farm this size will be too much of a financial barrier to enter into that business. Serious look (needs to be taken) at smaller models of agriculture. Donald LaFleur, Vice President of the Canadian Labour Congress spoke on socially and economically equitable employment. By 2025, every house on PEI will be transitioned to heat via air-sourced heat pumps. By 2017, all new energy sources will be wind, water, and hydro; all new cooling and heating technologies will be compatible with wind, solar, and hydro power. Homes that are net energy producers should receive compensation for the electricity that their renewable energy systems place back into the system. Yes, Maritime Electric is taking on the cost of power storage for when the supply is greater than demand, ME is still benefitting overall by charging customers for electricity that they themselves did not create. Customers should be fairly paid for the energy they produce, with costs for infrastructure and services provided by ME being the only subtraction from that payment. Political opportunities: pre-budget roundtable; green jobs suggested as an idea to help the PEI economy. As UPEI and Holland College are investing money in renewable energy and sustainable design engineering courses, what is the point of so much financial investment in these education programs if there are no jobs from the students when they graduate? There must be an equal investment from the government in creating jobs and supporting businesses in infrastructure projects that will match the skills of new graduates with gainful employment? Creating of an education program for small-scale organic production. Cooperation with ACORN’s existing Grow-A-Farmer program, which pairs aspiring farmers in an unpaid apprenticeship with organic farmers. Government investment could make these paid apprenticeships, just like the apprenticeship programs for large-scale industrial farms. By 2025, the Island will be transitioned to 100% organic production. It was a welcoming and inspiring day for the participants, with great thanks to the organizers. The participants in the group is going to resume meetings in P.E.I. regularly, likely in the new year. NDP Social, 6:30-8:30PM, Charlottetown Legion. All welcome. A Corporate Research Associates poll was released yesterday that was conducted from November 5th until November 25th. On November 13th, Premier Ghiz announced his retreat from being Premier until the next leader is chosen, and the poll indicates the Liberal Party is still ahead in the polls. This is kind of funny that CRA would even bother finishing the poll with such a change in the middle of it. but on Mainstreet about 5:45PM, in a longer clip, he said, basically, it's a vindication of his government and the tough "politically unpopular" decisions it has made. Doublespeak. Publisher Paul MacNeill and journalism instructor Rick MacLean commented on things as of last Friday on the Compass political panel. Paul comments specifically on the spectacle of (Liberal leadership contender) Wade MacLauchlan talking about change and "then wrapping his arms around 19 MLAs" who are "all smiling like Cheshire Cats." It is about 4 minutes long. James Aylward, MLA for Stratford-Kinlock, is the first candidate to declare officially for the Progressive Conservative leadership, last night in Stratford. Apparently, business owner and health administrator Darlene Compton is set to announce on Wednesday, and Rob Lantz, former City of Charlottetown Councillor, is set to declare on Thursday. Jamie Larkin, who most recently lost the closest Charlottetown councillor race in a long time, has decided to run for the NDP in the provincial district of Charlottetown-Parkdale, currently held by Health Minister Doug Currie. Some people are easy to tag with one label, but admittedly, Allan Rankin's main professions are a wonderful hodge-podge -- musician, and senior bureaucrat through multiple governments. With that background, and his reputation as a honest and caring Islander, he is a wonderful choice to have a column in The Eastern Graphic called "Thinking About It". I still regard that as a compliment. My Conservative friends will tell you that while I might have started out as a Tory I ‘turned’ in 1989 when Liberal Premier Joe Ghiz asked me to be Deputy Minister of Community and Cultural Affairs. I remember at the time Bob Morrissey and several other Liberal ministers questioned my appointment suspecting my blood was irrevocably blue. Ironically, seven years later the new Conservative Premier, Pat Binns summarily fired me, certain my blood was now red and therefore I could not be trusted within the PC fold. With both main line political parties on the Island set to choose a new leader within the next few months, and presuming at least one of them will be our next premier, it’s time we ask an few overriding questions. What qualities and abilities should Islanders look for in their next premier? Who is the man or woman most likely to make a difference? Forget the Blue Team and the Red Team for a moment. Forget about Grits and Tories and all the partisanship I believe can obscure free thinking and responsible citizenship. Each party will go about its leadership business of course, however, our shared challenge as Islanders is to find an individual who possesses the vision, character and inner strength and the abilities to lead from the front. It would be convenient I suppose to assemble our quintessential premier from the best attributes of previous Island premiers, or genetically engineer the individual like an AquaBounty salmon, but none of that is possible. Therefore we must select from the known gene pool. Now I am going to state what some will think is a contradiction. In my opinion, we need a premier who is only secondarily a politician, for a premier who views himself as a political operator first will be more interested in consensus and compromise than in making tough, right decisions. More troublesome perhaps, the thoroughbred politician who occupies the premier’s chair will often serve the party ahead of the province, and a small group of friends ahead of the wider population. In a government led by such a premier, partisanship and favouritism often will rule the day. Our outgoing premier is a decent and intelligent man who has served the Island with conviction and dignity. Robert Ghiz could have been a great premier and not just a successful one. His keen sense of social responsibility and desire to help children and families in particular, together with his formidable communications skills, should have rocketed him higher and produced a greater legacy. Sadly, the PNP debacle revealed another kind of premier. It is always dangerous for a premier to manage any file within his own office, especially one that is potentially controversial and involves the disbursement of money. Premier Ghiz could not resist a direct role in administering and disbursing PNP units, and as a consequence he became ensnared in the irregularities and outrageous behaviour that surrounded that program. It is cruel perhaps to say this, but his father, the late Premier Joe Ghiz would not have made that mistake. I believe Robert Ghiz was also a product of his own upbringing. Brighton born and raised, I don’t believe he ever felt completely at home outside of Charlottetown, and he enjoyed the halting respect but never the admiration of rural Prince Edward Island. Our next premier should wear the Island like an old suit of clothes. Our next premier needs to be comfortable in their own skin, and feel at home in urban and rural communities, around the board table, in the barn, and on the wharf. It’s a tall order I realize. Above all, the next premier of Prince Edward Island must be willing to stand tall for the province, and possess the intelligence and gravities to be taken seriously at the national level. Prince Edward Island always needs to be capable of swinging above its weight. That takes outstanding political leadership at the top. We don’t need an emperor premier, or someone who relishes micro management and certainly broad direction and forward planning should be built around meaningful public engagement. But we desperately need a mature individualist who loves their province and is confident about its future. Islanders need and deserve someone who can restore our hope. Accepting that a genetically engineered premier is off the table, we must rely on our political parties to find the man or woman with the right stuff. Perhaps that individual will shroud themselves in party red, or blue, or green, or whatever. It’s not about party affiliation or the 50 shades of political ideology. To embrace the spirit of the coming season, it’s about gifting ourselves with a premier we need more than want, a leader of quality and substance underneath the pretty wrapping. Music to promote Sierra Club "Wild Child" program, 1-2:30PM, Timothy's World Coffee, University Avenue, Charlottetown. Musicians Rowen, Jeremy and Jonathan Gallant will be featured in Wild Child's launch at Timothy's World Coffee Monday, December 8th from 1:00 - 2:30 pm. For the month of December patrons can add 50 cents or more to their Timothy's drink to show their support for 'Wild Child'. Wild Child, a program of Sierra Club Canada Foundation, is designed to get children in day cares outdoors experiencing nature. Jeremy and Jonathan Gallant starred in Lennie Gallant's show "Searching for Abegweit". Rowen Gallant is the renowned fiddler for the group Ten Strings and a Goat Skin. They will be joined by singers Jordan MacPhee and Tony Reddin. There will also be shared some ideas of activities for kids and adults to have fun outside connecting with nature. Those who are able are encouraged to go for a walk today, and maybe stop by Timothy's for a nice 'Wild' drink. And anytime, all month, Timothy's will make your drink a 'wild' one. For more information contact Hanna Hameline at wildchildpei@gmail.com or 902-326-3914, or to make a donation, please go to www.sierraclub.ca/en/wildchild. James Aylward, PC MLA for Stratford-Kinlock, is making an announcement tonight at 7PM at the Stratford Town Hall. All are invited. 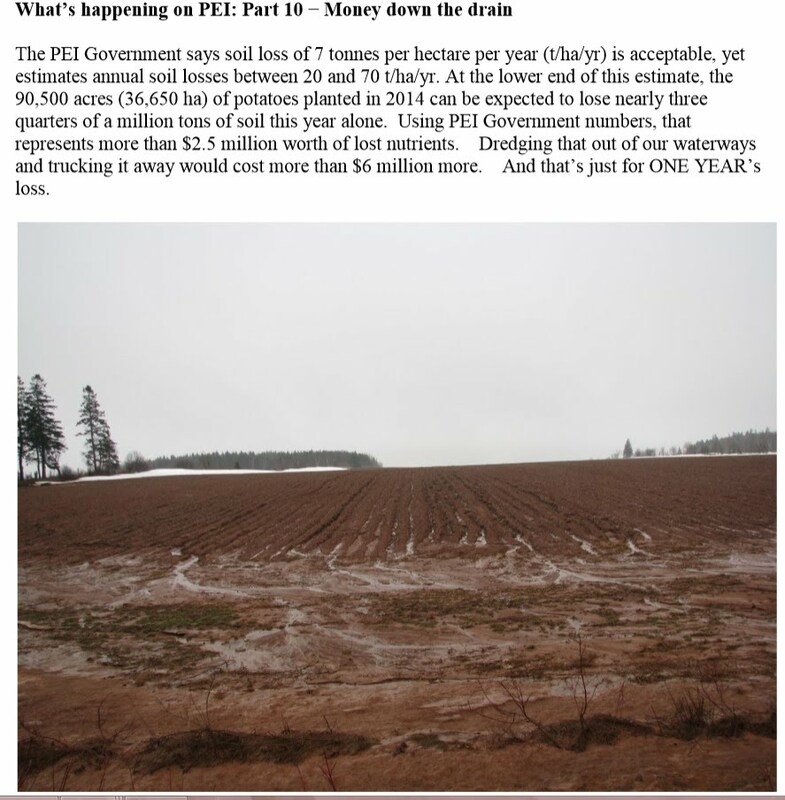 Pesticide Free PEI meeting, 7PM, Haviland Club. Lots of follow-up and planning to do -- all welcome. Christmas Social for NDP PEI members and supporters, 7:30PM, Canada Lounge of Charlottetown Legion, 99 Pownal Street. You are invited to attend a Christmas Social for NDP PEI members, to be held on Wednesday December 10 at 7:30 p.m. in the Canada Lounge of the Charlottetown Legion, 99 Pownal St.
Members of Provincial Council will hold their December meeting prior to the social, from 6:30-7:30 p.m.
A cash bar will be available at the social, and members are also asked to bring food or snacks to share. Please respond to Peter Meggs at meggs@eastlink.ca or pcmeggs50@gmail.com, indicating whether you will be able to attend and what type of food or snack you’ll be able to bring. I am assured anyone interested is welcome to drop in! Green Party Coffeehouse in Cardigan Riding, 1-3PM. All are welcome. E-mail Darcie for the address. This is the federal Green Party deputy leader Bruce Hyer's last stop on the Island before heading back to Ontario. "Vinland in Fact or Fiction" public talk tonight, 7:30PM, Irish Cultural Centre (BIS Hall), North River Road, Charlottetown. Dr. Sile (Sheila) Post will be presenting. For more info: https://www.facebook.com/vinlandpei?hc_location=timeline This talk, sponsored by the Vinland Society of P.E.I., is the last one for 2014. 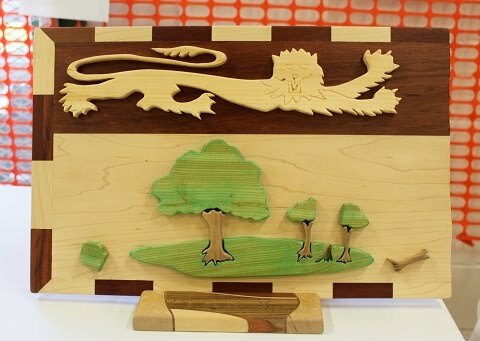 One of the people at the Artisan Market today will be artisan woodworker Gary Loo. A little over two years ago, in response to Plan B, Gary made a piece of art called Flawed Flag. Island craftsman Gary Loo has created a woodcut version of a flawed Prince Edward Island flag in support of the Plan B protest. The woodcut is partly constructed of downfall wood from species which will be felled by Plan B (maple, spruce, birch, pine and larch). Other wood types used in the piece include mahogany and walnut. A photo of it was taken, framed and wrapped, and a certain Secret Santa greeted MLAs on the last morning of the Legislature sitting in Fall 2012 -- December 7th, I think -- and chatted to Premier Ghiz about being naughty and not listening to the public about Plan B, which was already well into tree-chopping and bulldozing phases. I understand it was suggested he hang the photo in Province House, or perhaps his office. Another correction from Saturday, as I identified Gail Shea as MP for Cardigan, not Egmont. Lawrence MacAulay represents Cardigan. 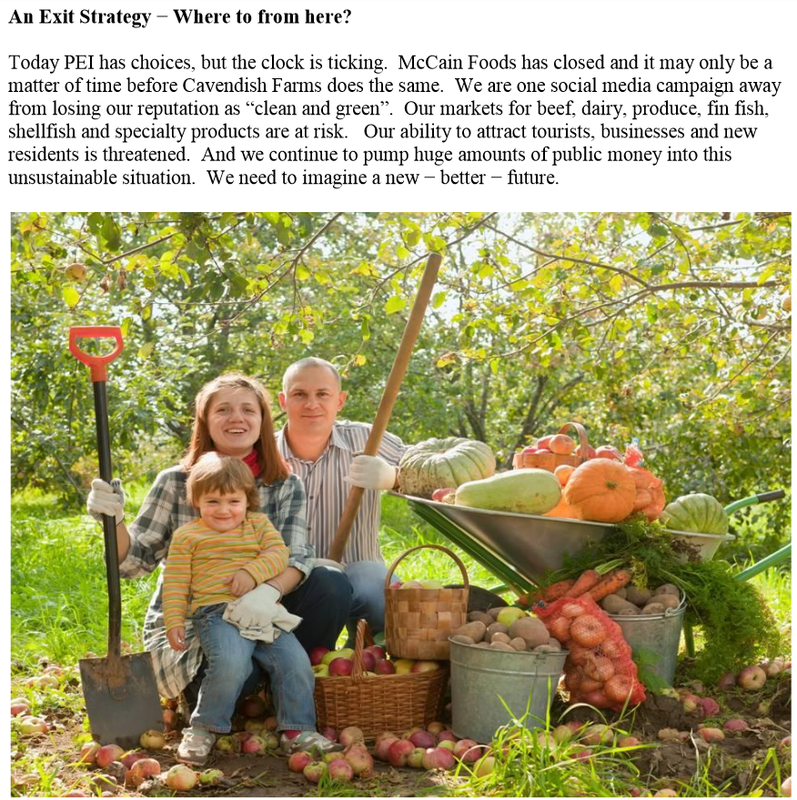 The article "Investing Gone Awry" in the Nov. 28 issue of The Guardian sheds a dark light on some of the efforts that have been made to get P.E.I. involved in the world of gambling. It notes "a plan that would have seen the province become an online gaming hub for the whole country." When that did not get approved, the next plan "aimed to turn P.E.I. into a financial service centre, similar to the Cayman Islands or Dublin, Ireland. "That one never materialized either, but was replaced by "a proposal to make P.E.I. the first and only Internet gaming regulator for Canada". Whatever happened to the "Gentle Island" or the 'Garden of the Gulf"? Has a serpent invaded? I scream, I scream for the Island! Does anyone have a slate handy to knock some sense into the heads of people pursuing "a proposal to make gaming the first of several phases that would make P.E.I. a financial transaction "hub" for the continent? We would need a big slate. Also, today, NDP Holiday Social with Joe Byrne, 2:30 to 4:30PM, St. Peter's Cathedral Hall , All Souls Lane, Charlottetown. A donation for the Upper Room Food Bank would be appreciated. Wednesday's vote in Parliament regarding proportional representation was defeated, from 110 to 166 votes. The Conservatives against, the NDP and Green for, and the Liberals split. On the Island, Gail Shea (Cardigan, Conservative) and Liberal Laurence MacAuley voted against the motion, Sean Casey appears not to have voted, and Wayne Easter voted for it. That, in the opinion of the House: (a) the next federal election should be the last conducted under the current first-past-the-post electoral system which has repeatedly delivered a majority of seats to parties supported by a minority of voters, or under any other winner-take-all electoral system; and (b) a form of mixed-member proportional representation would be the best electoral system for Canada. Wade MacLauchlan is the candidate Tories and Liberals both coveted; he is also the man almost everyone expected never to run for public office. So when he actually did drop his name in the ring to replace Robert Ghiz it came as a surprise, bordering on shock, to many. At the top of the disappointed list is a whole host of current cabinet ministers who quietly jockeyed for best position in the event Ghiz did move on from the Big Chair. MacLauchlan’s entry sucked the air out of any hope the Liberals had of a competitive leadership race. And there is reason for that. He is well respected and has a record of achievement that includes co-chair of The Georgetown Conference, an idea for a non-political event focused on rural Atlantic Canada that originated with me. His role has now changed. Mine hasn’t. Two weeks ago almost all Grit MLAs and cabinet ministers fancied themselves a potential successor. When MacLauchlan announced, 19 current Liberal MLAs (only Carolyn Bertram, Valerie Docherty, rumoured leadership hopeful Robert Mitchell as well Ghiz himself were absent) were present. It was a picture for the Liberal Party, not the province. And it could come back to bite the candidate. Wade MacLauchlan doesn’t need the Liberal caucus; they need him. And coronations rarely are good in the long run for candidate, party or province. Those set to receive the crown always benefit from a little bruising. Wade MacLauchlan boasts a resume that makes him arguably among the most qualified candidate for premier our province has seen in more than a generation. He is not without detractors or issues that need to be addressed. The NDP call him elitist. The Tories argue his record as President of UPEI resulted in the multi-million dollar budget shortfall and cutbacks of today. During his tenure there were lawsuits and a faculty strike. These are valid arguments that deserve debate. Any Liberal who thinks the party is better off with a leader untested before an election is delusional. History is littered with sure-fire candidates who wilt under the pressure of a campaign. MacLauchlan’s first obstacle is to win leadership of the Liberal Party – given the love fest of last week this is not an issue. His biggest challenge is to substantively change the face and focus of government. He may be the face of change for the Liberal Party, but the 19 sitting MLAs who stood behind him are not. They are the face of an arrogant administration that has expanded and centralized an already bloated bureaucracy, cut services to rural PEI, ignored major issues impacting our sustainability as a province, allowed patronage perks to flow to themselves and friends of government while jacking every fee imaginable on ordinary Islanders. This is an administration that spent like drunken sailors but received little in return. This is a government that ignores the necessity for sweeping change to our education system if we are to have any hope of attracting and keeping new Islanders and creating an economy built on something more than seasonal work. Where does Wade MacLauchlan stand on the Ghiz record? We don’t know. To be trusted as the face of change the picture of smiling Liberals standing behind the presumptive new leader must change. Ridings held by Independent Olive Crane, three Tories and Robert Ghiz give him five seats to find candidates without the taint of the Ghiz years. But that is not nearly enough to imprint a new face on an old government whose record in rural PEI is abysmal. So who will step aside? What cabinet ministers will be shunted to the backbench? What MLAs will put renewal ahead of self? MacLauchlan’s steamroll to the leadership has created an unnatural euphoria among elected Liberals and the throngs of government hangers-on who imagine eight more years of uninterrupted life at the trough. Having worked for three years with Wade MacLauchlan on the Georgetown Conference and its follow up, I doubt this is the type of government he favours. We simply don’t know what his priorities are or what his proposed roadmap is for the transformative change he speaks of. But unless he emphatically puts his own stamp on the party and government – both in terms of elected members, fifth floor operatives and deputy ministers – the bureaucracy and Liberal establishment will bring to a screeching halt any notion of transformational leadership he may have. MacLauchlan speaks of a leadership that ‘squares up to the challenges’ we face. We should all hope he succeeds because successive Tory and Liberal regimes have ignored the great and imminent issues we face. But if he fails at his most pressing challenge – bringing change to the Liberal regime he is set to inherit – his odds of success will drop precipitously. Peter Bevan Baker’s letter of Dec. 3 speaks to the need for strong leadership and a new direction on the political front in Prince Edward Island. He hopes Wade MacLauchlan is a harbinger of a new political direction on P.E.I. I so hope he is right. MacLauchlan has the credentials and the experience to set that new direction. However, so does Bevan-Baker. It is wonderful to see the leader of a political party inspiring those in another party to move forward in a new, positive direction without the usual partisan cheap shots. The philosophical differences between the prominent political parties in this province have long disappeared into the mire of small-minded personal attacks and nit picking. The big picture is rarely, if ever addressed. Unfortunately the traditional third party has chosen to go down the same mired road. It seems Wade MacLauchlan will be given the opportunity to create positive change through his leadership. Peter Bevan-Baker is another who shows the qualities that could lead this province out of its political malaise. After those two, the depth of inspired political leadership seems to run rather thin as of late in this province. The last few weeks have seen the business of governing P.E.I. being trumped by MLAs currying favour with potential leaders in soon-to-be re-booted political parties. An encouraging counterpoint to this was the report delivered to the legislature from the Standing Committee on Agriculture, Environment, Energy and Forestry. This multi-party committee received 29 presentations and 16 written submissions over several months and presented its report on the 19th of November. This was one of the few opportunities the electorate had to directly engage with their elected representatives on important issues. Among other things the committee recommended was not lifting the 2002 moratorium on high capacity wells. The Guardian editorial of November 24 (Committee procrastinates on wells issue) kicked this process to the curb. The editor berated the committee membership for not providing a timely report appropriate to the perceived needs of a portion of the potato processing industry. The issues arising from high- capacity wells represent a fraction of the elements that must be included in a comprehensive water act. This editorial simplifies and trivializes a primary recommendation of the committee. 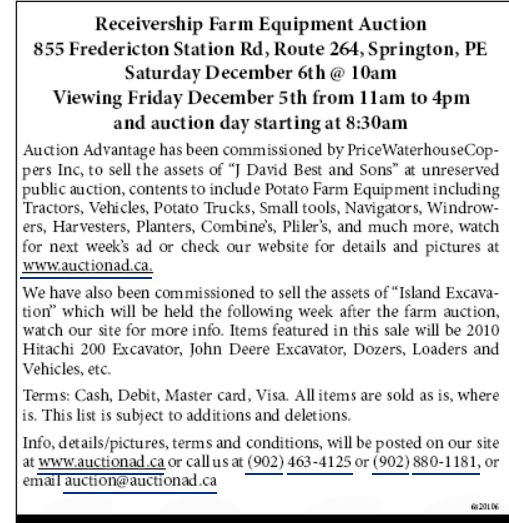 It is interesting to note the following day’s Guardian featured an article on Agriculture Minister George Webster’s address to the AGM of the P.E.I. Potato Board (which took place on the previous Friday). Is this the minister’s goal, the government’s goal or the industry’s goal? The Webster Dictionary defines the word “discuss” (verb): to talk about (something) with another person or group. The minister’s version of a discussion is strikingly similar to the government’s road-tested announce and defend style of public consultation. As we look to the future, the Water Act will be of utmost importance to all Islanders. The old style driven by political expediency and vested interest carries unacceptable risk. And as mentioned previously, Minister Webster was questioned on the floor of the Legislature the last day of the session (Thursday, November 27th) and demurred that of course he understood about the public consultations and the authority of the moratorium over his own desires for segments of the agricultural industry. The Green Party is having a "Big Green Weekend", with Deputy Leader Bruce Hyer coming to the Island and going to events in several parts of the Island. This afternoon at the Farm Centre (3:30PM) , the Charlottetown candidate for MP will be announced. Big Green Social, 7PM, Bites Cafe in Hampton. Admission $20 with John Rehder and company providing music for socializing or dancing, and food and drinks for sale. The candidate for Malpeque will be there, too. for informal conversations with Islanders. NDP Christmas Social with Joe Byrne, 2:30-4:30PM, St. Peter's Cathedral Hall, All Souls Lane, Charlottetown. All welcome. Federal NDP MP Guy Caron of Rimouski, QC, will be in attendance, entertainment by Dylan Mensie, refreshments, goodwill offering (non-perishable food item) for Upper Room Food Bank auggested. Green Party Meet and Greet, 6:30-9:30PM, Arts Guild, 111 Queen Street. The Charlottetown candidate for MP will be there, again, along with Deputy Leader Bruce Hyer. Green Party Cardigan Coffeehouse, 2-3:30PM, Cardigan, details to follow. Progressive Conservative MLA James Aylward's Announcement, 7PM, Stratford Town Hall, refreshments and entertainment. In the final public lecture of the year, sponsored by the Vinland Society of Prince Edward Island, the search for Vinland will continue, ranging from the realm of geography to that of the imagination. Our guide on this journey will be Dr. Síle (Sheila) Post, a writer with doctoral work in Scandinavian Studies. A former university professor, Dr. Post now writes about “Place” – the local and the transcendental – in the old/new worlds of Maritime Canada and New England. Her current novel project, aptly called Vinland, is set on the Island where she resides, blogs and writes fiction (when not writing in Vermont). In her talk, Síle Post will explore both the literal and the imaginary Vinland. She will examine the fascinating links among place, people and metaphor through time-honoured symbols that help to locate and celebrate Vinland as place and theme – with compelling thematic significance for us as Islanders, followed by a reading from her own Vinland. Síle Post will present her lecture on Sunday, December 7th, beginning at 7:30. The location is the Irish Cultural Centre (BIS Hall), on North River Road, Charlottetown. All are welcome. From Tuesday night, at the "Land Use Policy at an Impasse?" forum at UPEI, the first major speaker was Jean-Paul Arsenault, a former director of forestry and a land planning expert, among other professions. He talked about the extensive history of those giant commission reports that have been done since the 1970s, his having contributed many hours of his life to most of them. With steely honestly he speculated on the political and moneyed interference that had likely kept many, many of the recommendations from being enacted. He reminded us about some land use facts-- how little of the Island has any official land use plan, for instance -- and he discussed subdivisions bursting forth like fungus near a bright, shiny sign in the most unlikely places, reasons why these have happened, and factors to consider. He mentioned Eastern Kings as an amalgamated area that made an official plan, and what it says. When asked how could they do that and other communities haven't, co-host Ed MacDonald mentioned the near-recent history of a national park proposed for that area, giving the community something to come together apart (and that the Plan took a long time to put together and with many stages of discussion). J-P also referred to the issues in Hampton (over development at the Blue Spruce cottage area) and the still-under-wraps Hampton Mystery Project, where no one, including those whose land might be affected by any development, knows what is going on. Ian Petrie, former CBC journalist and landowner in Iona (and surrounded by a bunch of annoying back-to-the-landers, evidently) talked about the pressures facing conventional potato growers, the circa 1995 history of knee-buckling blows such as the PvyN virus, then-Prime Minister Paul Martin's cuts to the transportation sector, and amalgamation of supermarkets; and what he believes this industry needs to survive. He acknowledged that many farmers -- no matter their size -- are "a truckload away from bankruptcy", the larger farmers basically being more in debt, but some factors making it less obvious. And he spoke that he would very much like to see greater expansions of the ALUS program (Alternate Land Use Services), personalizing buffer zones to the field and best practices, and improvements such as increased organic matter being used to measure progress. Ian had three suggestions that would make a difference: again that buffer zones need to be individualized, the media needs to dig deeper in stories, and consumers, each of us, needs to reconsider just grabbing the cheapest food. With great respect for each gentleman, I must admit neither had any real suggestions for pulling us towards more consensus on land use policy, with the Big Picture of Island's future health (of the land, economic, people's) health in mind. Not that I have it, either :-) but we all need to keep talking about it, finding those with good ideas and sharing them. Much appreciation to the organizers and speakers of the UPEI event for continuing some discussion. More about the supplement in yesterday's Guardian called "The Real Dirt on Farming", a shiny, thick insert about food and farming in Canada. Well, a beautifully shot version of all kinds of conventional farming. While it did contain some accurate information, it was written in a soothing and paternalist style (from the sidebar on raw milk: (re: pasteurization "This is to destroy any pathogens, like salmonella or E. coli, which might be in the milk. These pathogens can make people sick and even cause death.") ("Some people believe neonics are contributing to bee death but there are conflicting views.....") and was definitely very slanted to seed (ha!) concerns about any small-scale, diversified or organic farming, and promote the need for genetic engineering, routine antibiotics, and intensive animal penning. But, gosh, it was pretty. Who is funding this info-mercial? The free insert had a $3 price on the cover, meaning, I think, that that value is accounted for somewhere in business-promotion costs. David Best and family from Tryon described their difficulties with farming and tried to have a crowd-source funding initiative over a year ago, when things were looking dire. It went from bad to worse. They are very decent people and I hope things work out OK.
Island Excavators was a family-run business in Crapaud, doing small and big constructions jobs. A very interesting Land Use Policy forum at UPEI last night. I know why the reporters for Island's media leave events early, so they can get the (perhaps incomplete) story packaged in a timely fashion for the 11PM news or morning paper; but I'll stick to compiling a more complete version for tomorrow. As I will regarding comments about the 52-page $3 glossy supplement in this morning's Guardian called "The Real Dirt on Farming", part of the national media campaign, evidently, to explain conventional farming to Canadians. Today, Islanders can contact their MPs about a proportional representation debate in the House of Commons. There is no Leadnow meeting this week; the next one will be in New Year. Wednesday, NDP District 17 AGM start time has changed to 7:30 PM. NaturePEI on whales with Chuck Gallison, Beaconsfield Carriage House. Green Climate Jobs of the Future at Murphy's Community Centre. I know the Land Use Policy forum is being video-recorded, and hopefully the Green Jobs will, too. We have (finally) put a calendar of events on the Citizens' Alliance website -- a clearinghouse so you can see what it going on, AND if you are planning something, you can check the date and see if the audience you are hoping for is already likely going to be at a similar event. May: We are a democracy only in theory. In practice, we're an elected dictatorship. Canadians no longer feel empowered; they are passive consumers. They have abandoned the notion that they have rights and responsibilities in running the country. It’s very hard to wake people back up to the fact that they have power. Forty per cent of Canadians don't vote. In the by-election in Fort McMurray-Athabasca last June, only 15 per cent voted. Unless we change the system, the next elected dictator could be [Justin] Trudeau or [Thomas] Mulcair, and we might like the decisions better, but it's still not a democracy. Today, democratically elected governments have little sense of sovereign power and are beholden to transnationals through things like investor-state agreements. We need to re-establish that democracies â and citizens â can choose what they want to do, whether it's saying no to something like the Enbridge Northern Gateway pipelines or weighing in on the Canada-China investor treaty. For many years, we’ve gone through deregulation, privatization and trade liberalization. Taxes and anything collective are demonized. Our kids have been raised in an era in which the message has been, government is bad. When I talk to young people, they say, I don't want the government doing this or that. But in a democracy, you should feel as though your government extends from the end of your fingertips to do collectively what you can't do as an individual. Our capacity to know what's actually going on has been diminished. The Internet has opened up the possibility for massive amounts of disinformation, masquerading as information. Social media has amplified the voices of the intolerant, the racists, the misogynists, the homophobic. I am on Twitter, and the stuff I get sent sometimes is horrific. There were always elements of our society that were intolerant, but one of the great things about Canada has been our respect for different viewpoints and the idea that we can come to consensus. We've always had this notion that we could disagree without being disagreeable. Today, the polite Canadian is disappearing. Conversations are no longer allowed. You're only allowed to yell slogans at each other across the aisle. May: The 2015 election is a chance to restore the Canada many of us want, but we have to be able to talk about what's gone wrong. Getting rid of an elected dictatorship requires reducing the power of political parties and amplifying the role of individual members of Parliament. Members of Parliament have to get back to actually representing their constituents. We need to say it over and over again: All MPs are equal, and the Prime Minister is simply supposed to be first among equals. We're like a little Popsicle stand. If you're ruthless, you can knock us over. Our constitution is based on the premise that those with power will not abuse it. There are no rules against the abuse of power; it's just not done. Stephen Harper doesn't have any real respect for Westminster parliamentary democracy. I don't think he is working in the interest of Canada. He is not in the pocket of all big corporations; he seems to be specifically ruling in the interest of Texas oil. "Do Members of Parliament really represent you? Or do you feel like they're more responsive to partisan interests and Ottawa insiders? How can we make sure our MPs work together to address the challenges of our times?" He'll try to address these concerns today. Public meeting on "Climate Jobs: How to Make the Shift to a Green Economic Future to Overcome the Triple "E" Crisis of Environment, the Economy, and Energy?" with Tony Clarke, founder of the Polaris Institute, at Murphy Community Centre, Room 207. NaturePEI will feature Chuck Gallison as their guest speaker, talking about Whales of P.E.I., at Beaconsfield Carriage House. "The Land Use Policy at an Impasse?" forum with Jean-Paul Arsenault and Ian Petrie, sponsored by the Institute of Island Studies, UPEI, McDougall Hall, room 242, MacKinnon auditorium . Wednesday, December 3rd, 7PM, District 17 PEI NDP meeting at the Bonshaw Community Centre, 25 Green Road. All are welcome. I have been asked to be guest speaker and will talk on "Democracy Ain't Broke, but Could Still Use Some Fixin' : Strategies for Improving Democracy on PEI." I will also expound on using poor grammar in marketing to engage the public (just kidding). Any District meetings of any party will be more important due to talk of a spring election. Thursday, December 4th, 6PM, PEI Chapter of Council of Canadians monthly meeting, at the Voluntary Resource Center on Prince Street in Charlottetown. "On the agenda will be a report from Leo Cheverie on the Council of Canadians annual meeting held this past October in Hamilton, Ontario. Leo C will also report on the Council of Canadians 'Stop the Pipelines Campaign.' Also on the agenda will be 'plans for the future.' Members and new members welcome!" Thursday will also very likely be the Leadnow/Fairvote meeting for December at 7PM. More details later. Friday marks the beginning of the Green Party of PEI's "Big Green Weekend". Friday, December 5th, 7PM, Social on Friday, Bites Cafe in Hampton, $20. "We'll meet Bruce Hyer, Deputy Leader of the Green Party of Canada and hear from our new Green Party Nominee for Malpeque. Peter Bevan-Baker, Leader of the PEI Greens will host. Admission is $20 and that will include two beverages and delicious local snacks. There will also be a pay-as-you-go Oyster Bar and Gluten-free Vegan Sushi. A pledge auction will be held, if you are planning to make a 2014 donation to the Green Party, please bring your chequebook. John Rehder and company will provide the entertainment." Saturday morning, there are stops at both Summerside (10-11AM) and Charlottetown Farmers' Markets (noon-1PM) to meet the Egmont candidate while in Summerside, and time for informal chatting with Bruce Hyer at both locations. Saturday evening, 6:30-9PM, Guild, the Charlottetown Candidate will be announced and in attendance, and Sunday a "Coffee and Conversation" in Cardigan from 1-3PM. Details and how volunteers are needed at link, above. He did just that in Charlottetown last Friday. The one-time lion of the left unleashed a withering roar over eight years of Stephen Harper government that deserves to be moved from the relatively tiny confines of the Confederation Centre of the Arts into a larger forum. · Canada’s world standing is in free fall. · The Harper government’s contempt for Parliament and its traditions has degraded political life and fostered voter cynicism. · Its attitude to aboriginals is not paternalistic, it is racist. · Harper’s refusal to join the rest of the world and move toward renewable energy sources is endangering future generations and contributing to a looming planetary meltdown. · Civil society and the ideas it fosters have been slapped down and censored, subverting democratic norms.